That the Minutes of the Development Assessment Panel Meeting held on 8 November 2017 be confirmed. That the Minutes of the Development Assessment Panel Meeting held on 25 October 2017 be confirmed. 1. The proposed development is inconsistent with State Environmental Planning Policy No. 44 – Koala Habitat Protection. Specifically inconsistent with the adopted Mahers Headland Koala Plan of Management. 2. The proposed development will have a significant adverse impact on biodiversity and threatened species, specifically the Koala. Section 5A of the Act is not considered to be satisfied. 3. The proposed development does not satisfy relevant planning controls and the variation of these planning controls is not considered to be in the public interest. 4. The site is not suitable for the proposed development. 5. The proposed development does not satisfactorily respond to the site attributes and environmental conditions. 6. The proposed development would have an adverse cumulative impact on the environment attributes of the locality. Specifically it will result in the eroding of environmental conditions within identified core Koala habitat and an important Koala habitat corridor/ linkage. 7. The lack of clarity and the potential conflict over the proposed Asset Protection Zones (APZ) and the ability to retain trees. The meeting closed at 3:08pm. That DA2017 – 559.1 for multi dwelling housing with a combination of strata and torrens subdivision at Lot 2, DP 1229893, No. 4 Tallow Way, Port Macquarie, be determined by granting consent subject to the recommended conditions. This report considers a development application for multi dwelling housing with a combination of strata and torrens title subdivision at the subject site and provides an assessment of the application in accordance with the Environmental Planning and Assessment Act 1979. Following exhibition of the application, two (2) submissions were received. One submission supported the proposal, while the second did not. The site has an area of approximately 1397m². 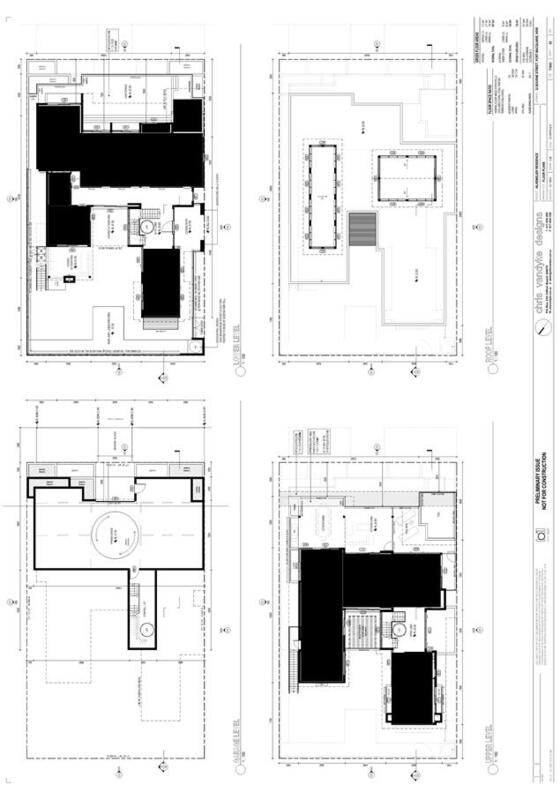 · Proposal involves three (3) single storey units with each containing 3 bedrooms and a double garage. · The front unit is to be located on a torrens title lot, while the rear two units will be strata title. · Five koala trees are to be removed. 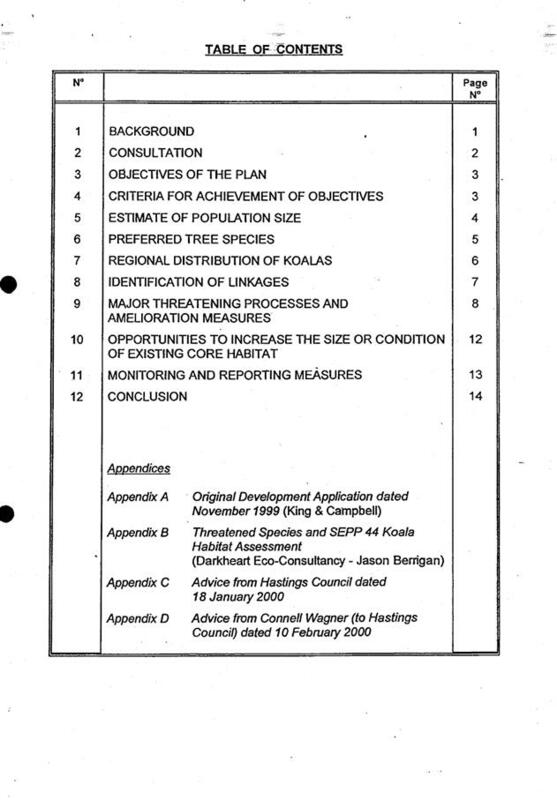 One of the trees is covered by the Major Innes Drive and Ruins Way Koala Plan of Management (KPOM) and requires 3:1 replacement (as per the applicable KPOM), while the other four are covered by the Port Macquarie Hastings Local Environmental Plan 2011 (LEP 2011) and Development Control Plan 2013 (DCP 2013) which requires 1:1 replacement. Therefore, seven replacement trees are required. Council staff have determined that an area exists within a nearby drainage area that aids in koala habitat linkages in the area. 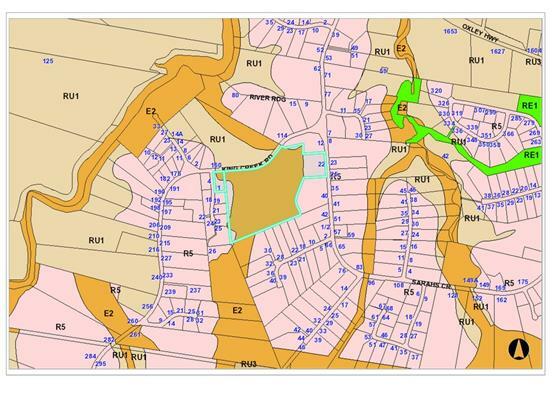 · 20/10/2010 – Council approved a boundary adjustment that created the subject lot. The boundary adjustment involved one lot that was within the KPOM and another lot that was not. As a result, the current lot is partially affected by a KPOM. · 30/6/2017 – The development application was lodged with Council. · 6/7/2017 – Council staff requested additional information on privacy and koala habitat. · 11-24/7/2017 – Notification period. · 18/7/2017 – Council staff provided further detail on koala habitat issue. · 7/8/2017 – Council staff discussed the screening issue with the applicant. · 14/8/2017 – Discussions between Council staff and the applicant regarding fencing/screening. · 18/8/2017 – Applicant provided information on fencing. · 21/8/2017 – Applicant provided response to koala habitat issue. · 22/8/2017 – Bushfire Safety Authority from NSW Rural Fire Service received. 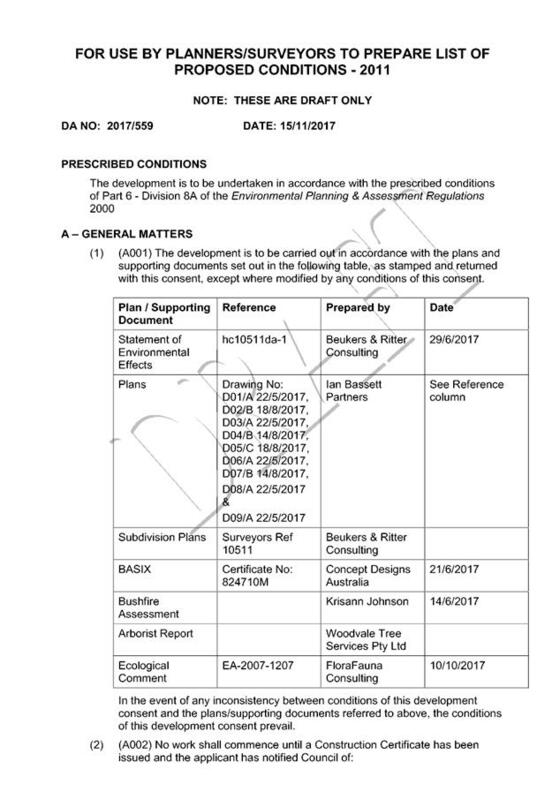 · 28/8/2017 – Council staff did not accept information provided on koala habitat issue. · 26/9/2017 – Applicant requested further detail on the KPOM. · 4/10/2017 – Council staff provided additional KPOM detail. 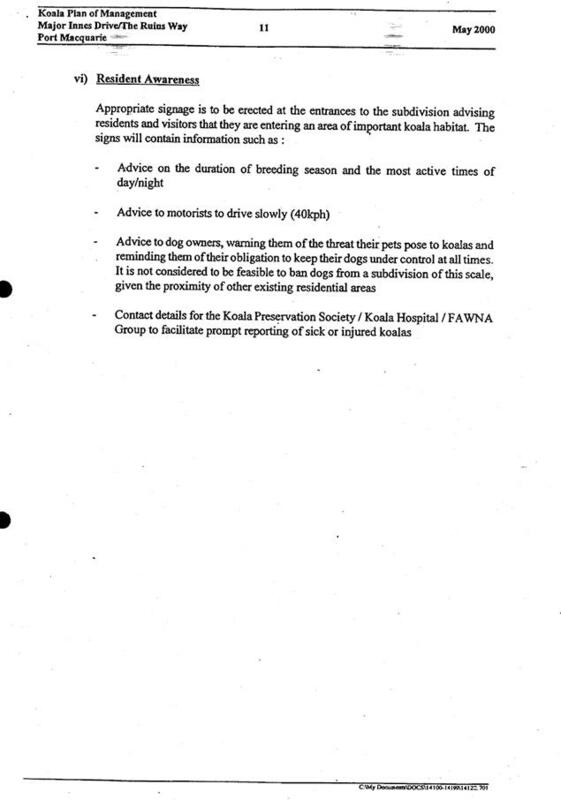 · 17/10/2017 – Revised information submitted on koala habitat issue. · 30/10/2017 – Applicant followed up on status of koala habitat issue. Council staff advised information was being reviewed. · 6/11/2017 - Applicant followed up on status of koala habitat issue. Council staff advised information was being reviewed. · 7/11/2017 – Council staff advised that the koala habitat issue had been addressed. The site is less than one hectare in size and would normally not trigger any further consideration of SEPP 44. 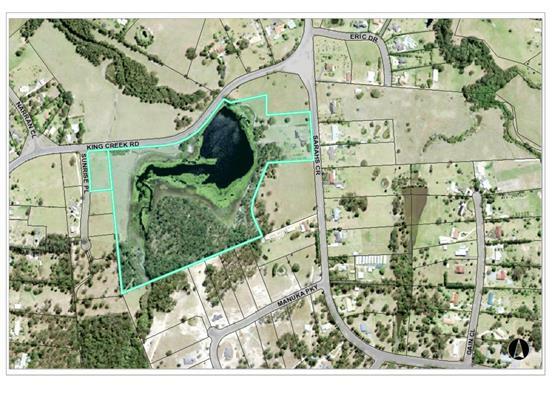 However, part of the site falls under the previously approved Major Innes Drive and Ruins Way Koala Plan of Management. Refer to image below and the area in green. 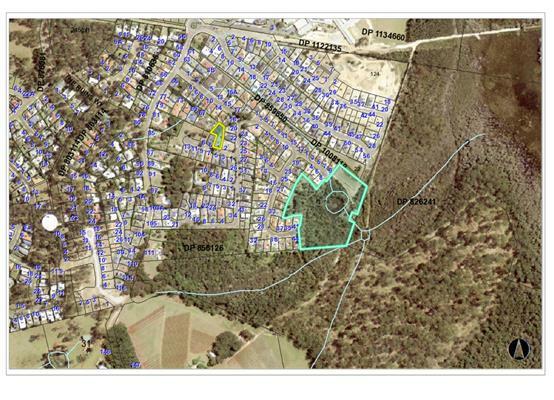 In this regard, only the trees within the above green area are covered by the KPOM, while the remainder are subject to standard tree removal provisions of the Port Macquarie Hastings Local Environmental Plan 2011 and Development Control Plan 2013 – discussed later in the report. The applicant has submitted an arborist report and ecological assessment that has subsequently been reviewed and accepted by Council staff. The reports conclude that of the seven trees within the KPOM area, only one in the centre of the lot definitely requires removal. The remaining six trees can either be retained or require further investigation work at the construction stage to determine retention. Conditions have been imposed to cover this aspect and should issues arise, the applicant will need to come back and modify the application before construction work commences. In terms of the tree to be removed, being located in the centre of the lot, it would have always been hard to retain. Furthermore, the assessment concluded that the tree had limited value and was of poor quality. 1. Replacement plantings at 3:1 will apply to the tree being removed in accordance with the KPOM. 2. The loss of the tree does not impact on any koala habitat, corridor or linkages. 3. The replacement plantings will occur within the more desired drainage area to the east of the site – see blue highlighted property in the attached map below with the development site highlighted yellow. The drainage area forms part of the key east/west koala habitat link identified in the KPOM. 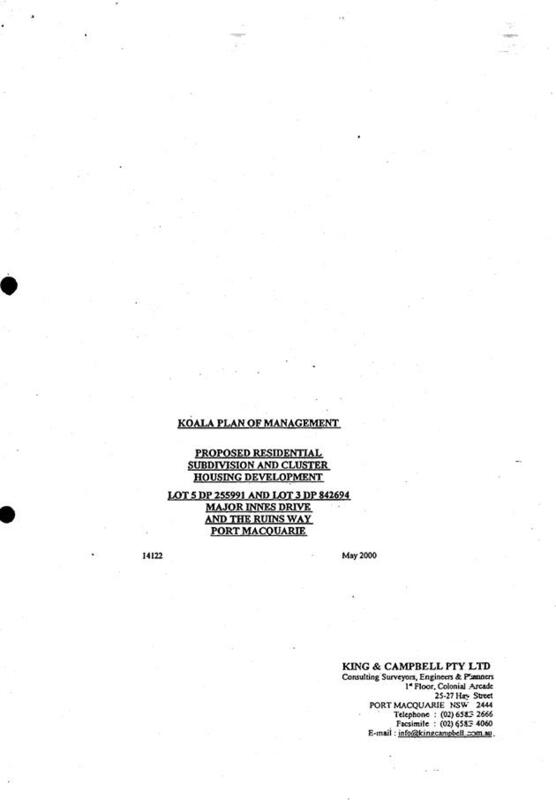 A copy of the KPOM is attached at the end of this report for the Panels information. · Clause 2.2, the subject site is zoned R1 General Residential. In accordance with clause 2.3(1) and the R1 zone landuse table, the proposed multi dwelling housing with a combination of torrens and strata subdivision is a permissible landuse with consent. 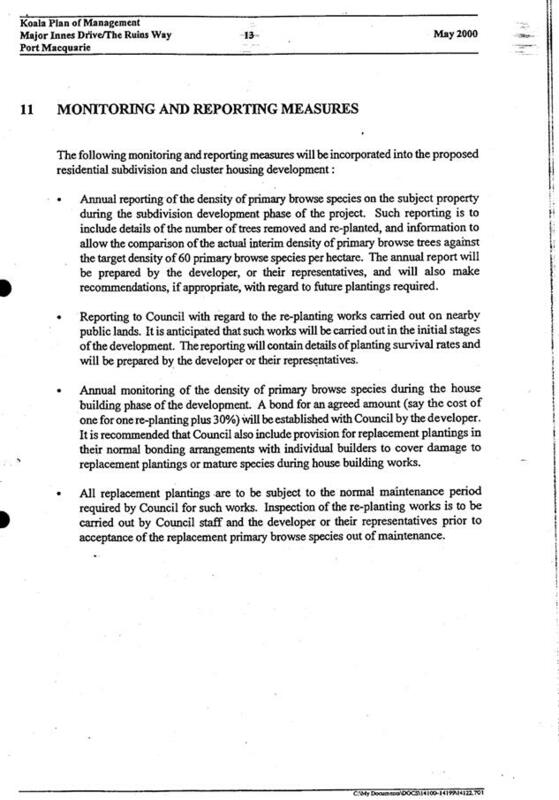 In accordance with Clause 2.3(2), the proposal is consistent with the zone objectives as it is a permissible landuse and complies with the established residential locality. · Clause 4.1, the proposed lots will be under the 450m² minimum lot size standard being 376.9m² Unit 1, 298.45m² Unit 2 and 296.1m² Unit 3. Clause 4.1A allows an integrated housing type application whereby construction and subdivision are included in the one application. When both construction and subdivision are included in the one application, Clause 4.1A allows the minimum lot size standard to be varied/reduced. · The intent of the clause is to encourage housing diversity without compromising residential amenity. This overall assessment report shows that the development will have limited impact on adjoining properties. The surrounding area also contains a mixture of low and medium density residential development. This proposal will be consistent with such a density. · Clause 4.3, the maximum overall height of the building above ground level (existing) is approximately 5.7m which complies with the standard height limit of 8.5m applying to the site. · Clause 4.4, the floor space ratio of the proposal is approximately 0.34:1.0 which complies with the maximum 0.65:1 floor space ratio applying to the site. 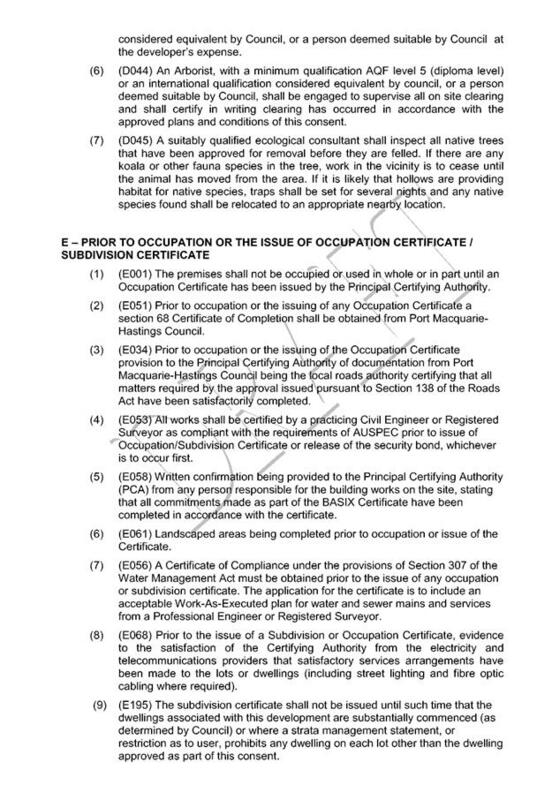 · Clause 5.9, the applicant has submitted an arborist report and ecological assessment that has subsequently been reviewed and the outcomes accepted by Council staff. 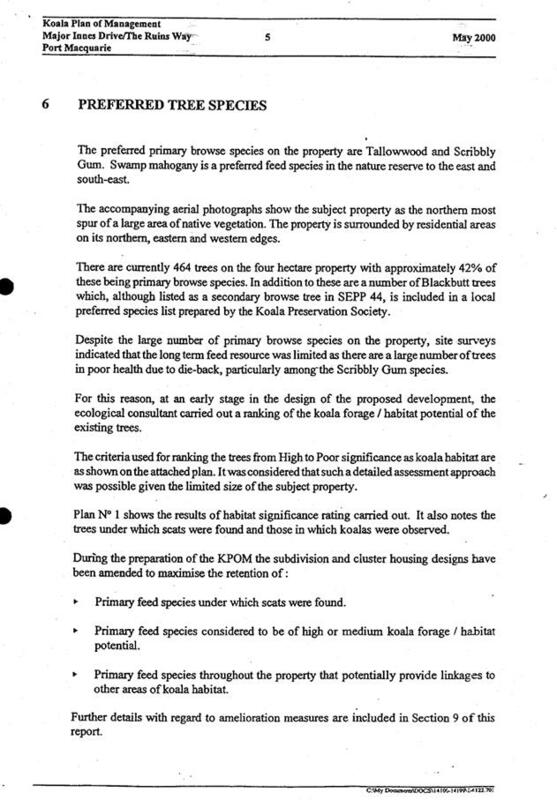 It should be noted that the trees located with the KPOM area are addressed above in the SEPP 44 component of this report. 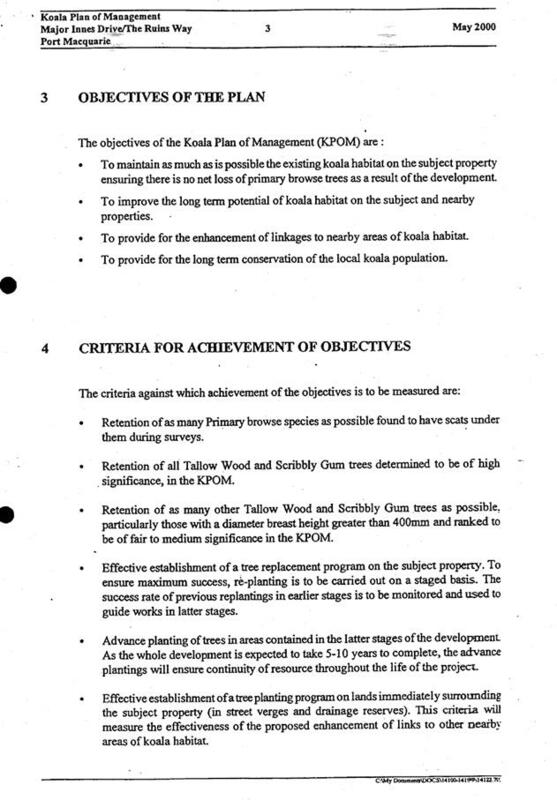 · In terms of the trees located outside the KPOM area, five are proposed to be removed, four of which are koala browse species. 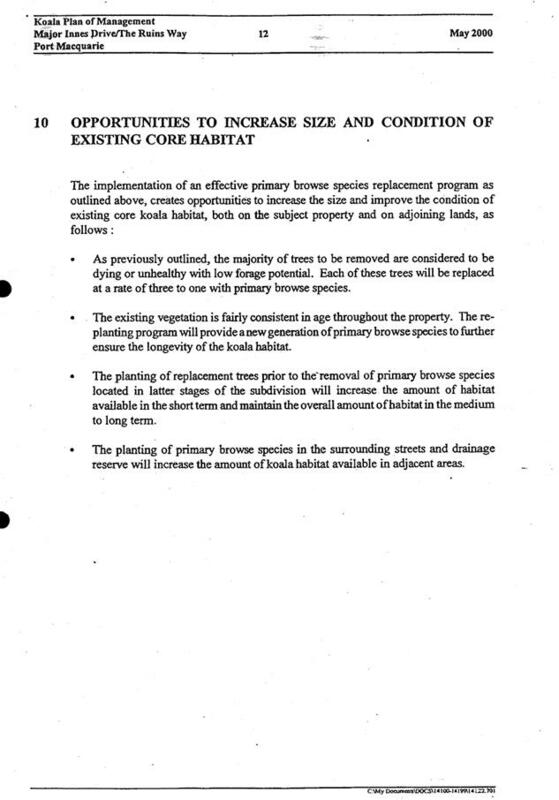 The subject trees were considered to have limited habitat or linkage value due in part to their isolation and being bound by existing residential development. 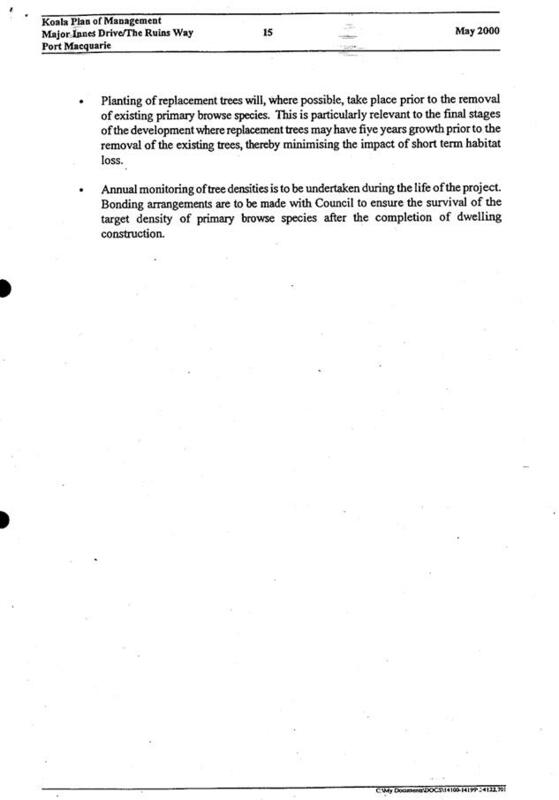 Council staff agreed with the approach of replacing the trees at the ratio of 1:1 as specified by DCP 2013. The subject replacement trees will also be located within the area identified in the SEPP 44 assessment above in this report. 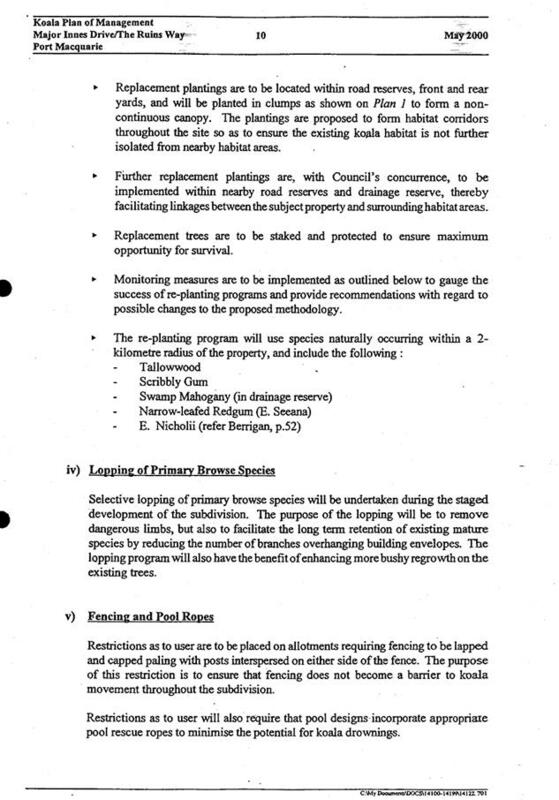 · Based on a combination of preserving trees in the front of the property (see SEPP 44 comments) and replacement plantings in a more appropriate area; the proposed development is considered to meet the tree preservation objectives in LEP 2011 and DCP 2013. 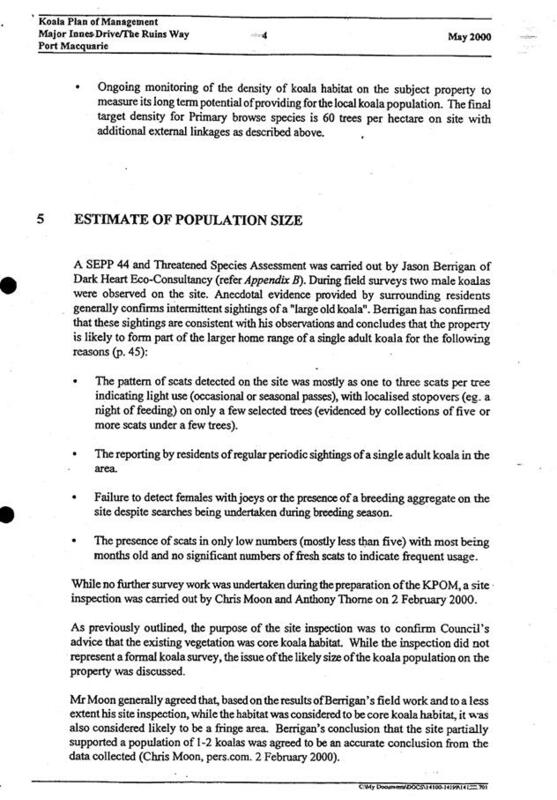 · Clause 7.5, refer to comments on SEPP 44 above in this report, which addresses koala habitat issues required to be considered under this clause. None relevant to the proposal. Water tank and clothesline can be provided in rear yards. Condition to be imposed. It is noted that the property is an unusual shape. The true rear boundary is considered to be the northern boundary, which measures 17.005m. While a 4m rear setback has not been provided to that boundary, an equivalent/greater length of 4m setback has been provided to the eastern boundary in accordance with the DCP. In particular, the development is setback over 6m from the eastern boundary for length exceeding 40m. Development complies with rear setback provisions in the DCP. Each dwelling contains 35m² open space in one area including a useable 4m x 4m space. The development will not compromise privacy in the area due to a combination of lack of windows on side/rear boundaries, having high sill windows that face side/rear boundaries, limiting living areas that face adjoining living areas/open space, compliant separation and use of screening/fencing. 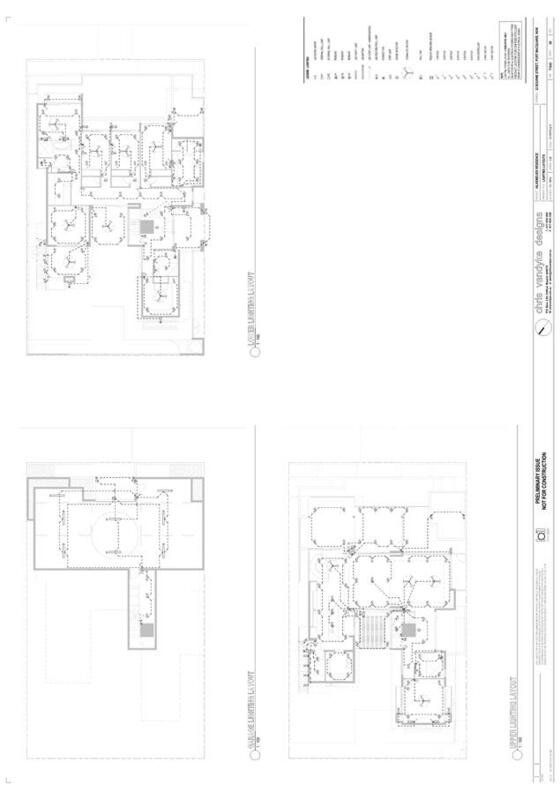 The privacy screen to Unit 3 (shown on the plans) will need to be extended to also factor in the living room windows. Where cut or fill extends 1m in height it is located more than 1m from a building. Retaining wall facing the street does not exceed 1m. 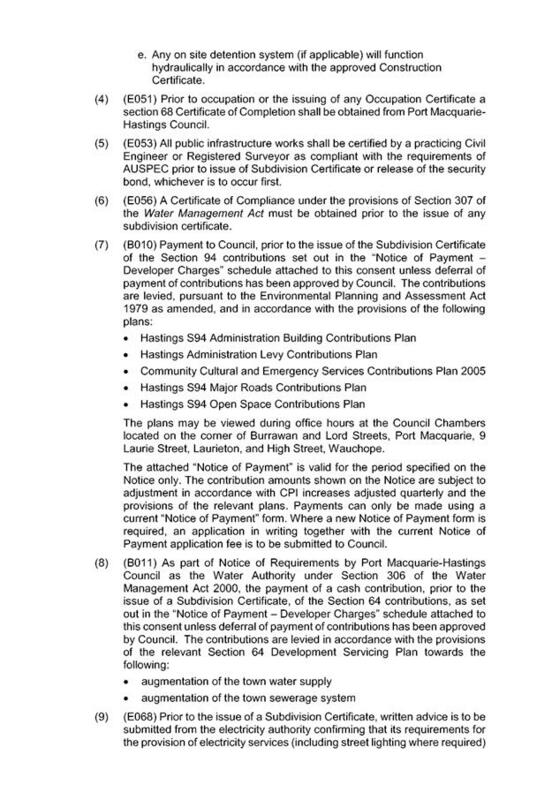 Refer to comments on Clause 5.9 in LEP section of the report. Proposal involves 3 x 3 bedroom units. Therefore, 3 x 1.5 spaces + 3 x 0.25 visitor spaces = 5.25 spaces required, which rounds to 6 spaces. The development proposes a total of 7 spaces via double garages per unit and a visitor space. Applicant has submitted a concept landscaping plan. Driveway grades capable of satisfying Council standards. The proposed area comprises a mixture of single dwellings interspersed with dual occupancies and unit developments. The majority of built form is single storey with the occasional two storey building. Considering the above, the proposal will be unlikely to have any adverse impacts to existing adjoining properties and satisfactorily addresses the public domain. The proposal is also considered to be consistent with other residential development in the locality and adequately addresses planning controls for the area. The site has road frontage to Tallow Way, a Council-owned ‘Access Place’ with a formation width of 5.5m within a 17m wide reserve. The road is bordered by layback (SE) type kerb and gutter on both sides and there is no existing concrete footpath near the site. The land comprising the site has previously (prior to boundary adjustment 2010/364) existed in the form of a residential lot and residual land on a neighbouring lot. 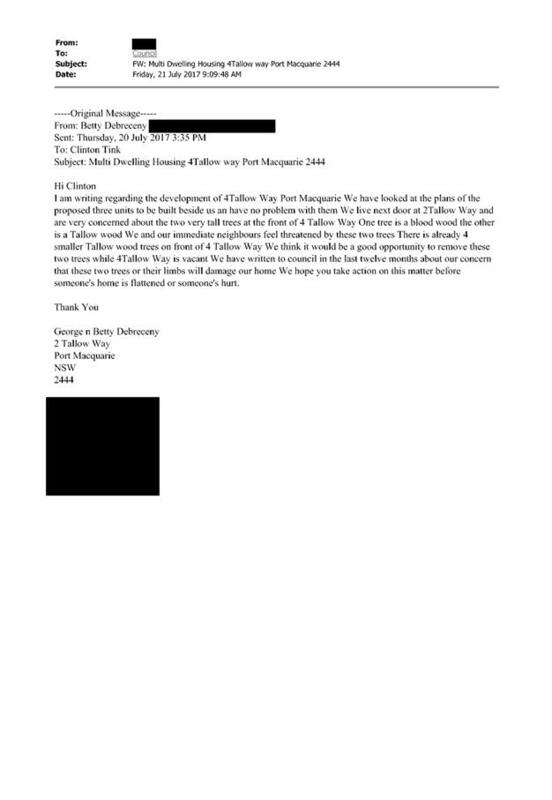 A single dwelling would have generated 7-9 daily trips on Tallow Way. This development proposes three dwellings which are considered likely to generate 21-27 daily trips. The additional traffic associated with the development is unlikely to have any adverse impacts on the existing road network within the immediate locality. Vehicle access to the site is proposed though a shared driveway with a right of access to Tallow Way. Access shall comply with Council AUSPEC and Australian Standards, and conditions have been imposed to reflect these requirements. Normally, due to the type and size of development, additional concrete footpath paving (minimum 1.2m wide) along the full frontage would be required. In this case, it is preferred that the focus be on retaining the koala trees in the street. Furthermore, Tallow Way is short in length and does not provide a connection to other areas. Based on the above, a concrete footpath will not be required in this case. The site naturally grades towards the northern rear section of the property and is currently serviced via two separate inter-allotment drainage lines, due to its previous history as two separate lots. The legal point of discharge for the proposed development is defined as direct connections to the existing inter-allotment drainage systems servicing the site. A detailed site stormwater management plan will be required to be submitted for assessment with the S.68 application and prior to the issue of a Construction Certificate. The concept plan provided by the applicant is largely acceptable subject to a few details which have been incorporated into conditions of consent. · On site stormwater detention facilities are not required as the site impervious portion is less than 30% (whether considering the entire site or the two lots separately). The parent subdivision included a downstream treatment drain including large basins and it is assumed that the design parameters for these works would have included an impervious area far greater than 30%. Therefore, existing infrastructure will adequately cater for the proposed development. 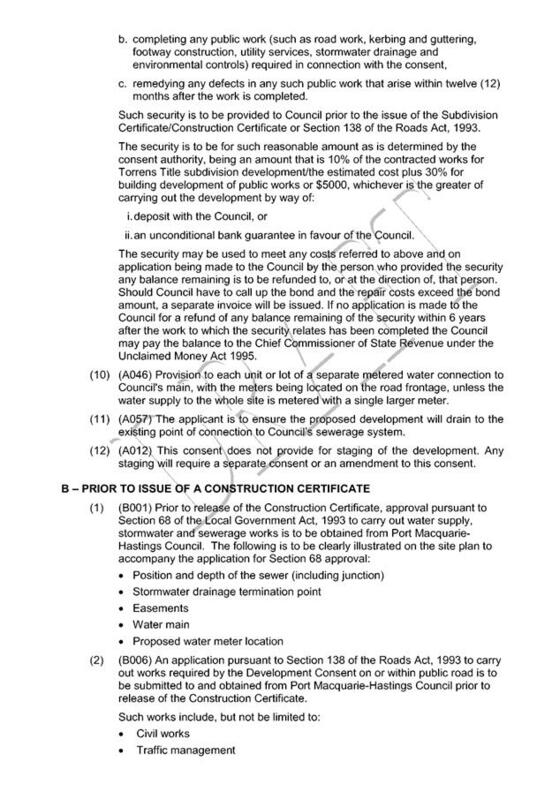 · Provision of inter-allotment drainage to allow the proposed development to drain to the nominated point of discharge via a single suitably sized conduit. · A neighbour has submitted concerns that local overland flows from the site have potential to inundate or cause nuisance to their property. Because the development proposal does not include stormwater detention onsite, the applicant will need to demonstrate that all overland flows up to the 1 in 100 year event (major storms) can be accommodated within the downstream drainage easements. If not accommodated, works are required to improve the downstream easements or an alternative drainage plan will be needed. This will limit any impacts on downstream properties to the site of the easement(s). 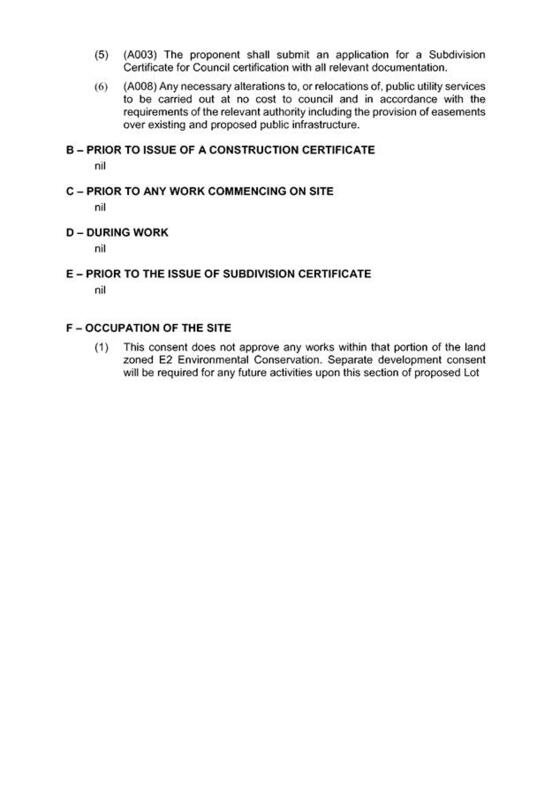 If works are required outside the site of the easement(s), the consent of that owner will also be needed. In accordance with Section 100B of the Rural Fires Act 1997, the application proposes subdivision of bush fire prone land that could lawfully be used for residential purposes. As a result, the applicant submitted a bushfire report prepared by a Certified Consultant. The report was forwarded to the NSW Rural Fire Service who have since issued a Bushfire Safety Authority with no requirements/issues. The increase in housing density will improve surveillance of the area. Two (2) written submissions were received following public exhibition of the application. Concerned about retaining the trees at the front of the property. Suggest trees should be removed before someone is hurt. Refer to comments on SEPP 44 above in this report. The intent of this application will be to try retain the trees at the front of the property. Due to the raised height of the patio to proposed Unit 3, people will be able to look over the fence into neighbouring properties. Any proposed screening will need to comply with swimming pool legislation. 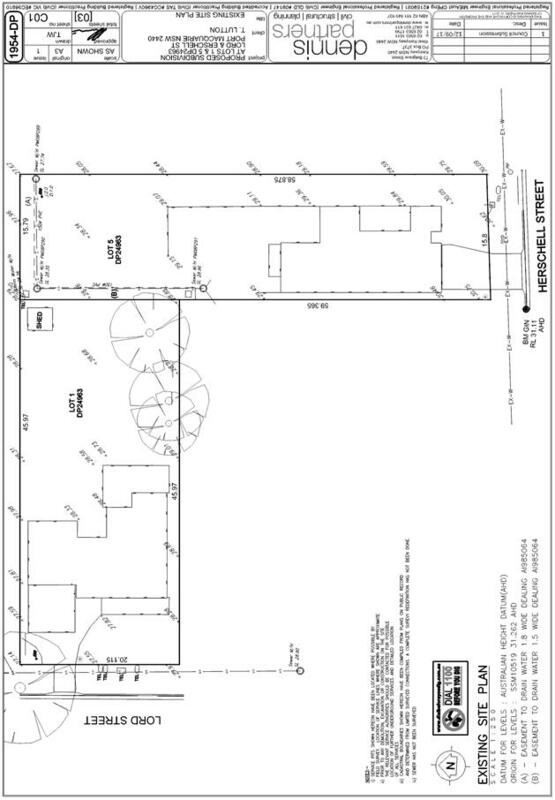 Applicant has amended the proposal with higher sections of screening near the patio area. While normally side fencing is 1.8m and the applicant shows a combined fence/screen of approximately 2.4m, the additional height is consider minor in overall length. No adverse impacts will occur from the added height. The screen will also be conditioned to be swimming pool compliant. Concerns about hard stands creating additional stormwater runoff. Refer to comments on Stormwater above in this report. Due to the fall, recommended a retaining wall be constructed along boundary to 16 Willandra. The intent of this requirement is unknown. If the intent is to divert stormwater, this aspect has been covered in the Stormwater section of this report. 1View. DA2017 - 559.1 Plans. 1. That DA 2017 – 563.1 for a boundary adjustment at Lot 101 DP 1205290 and Lot 101 DP 1214480, No. 22 Sarahs Crescent and 11 Sunrise Place, King Creek be determined by granting consent subject to the recommended conditions. 2. 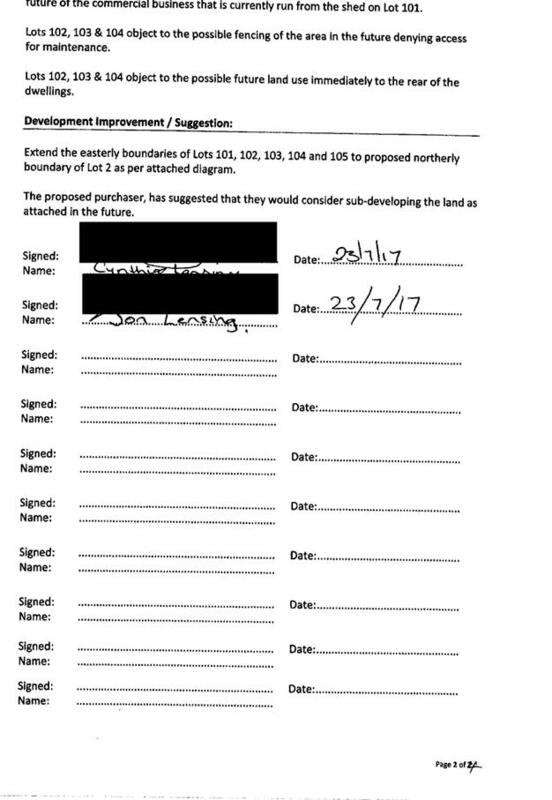 That Council’s Strategic Land Use Planning Team investigate the potential rezoning of part proposed Lot 1, as described in this report, for potential inclusion in the next round of LEP Amendments dealing with the planning anomalies identified in this report. This report considers a development application for a boundary adjustment at the subject site and provides an assessment of the application in accordance with the Environmental Planning and Assessment Act 1979. Following exhibition of the application, one submission, with five (5) signatories, has been received. The application comprises two allotments, being Lot 101 DP 1205290 (22 Sarahs Crescent) with a site area of 15.89ha and Lot 101 DP 1214480 (11 Sunrise Place) with a site area of 5,926sqm. ‘a) no vegetation shall be removed or firewood collected from the lot burdened within the area marked (B) on the plan. b) no water activities or uses shall be carried out within the area marked (B) on the plan that would create an adverse environmental impact on the dam located within the area marked (B). No. 11 Sunrise Place is zoned Part R5 Large Lot Residential and Part E2 Environmental Conservation. Both of the subject lots are legally known as a Lot 101. The DP’s for each site are different, being DP 1205290 and DP 1214480. Both sites are split zoned lots with approved residential dwellings constructed on them and both dwellings are located within the area zoned R5 within the respective lot. 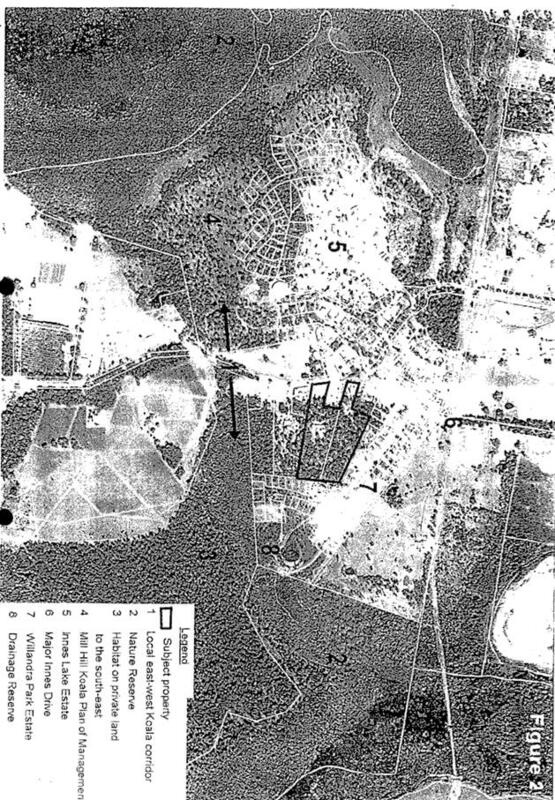 The history of development of the Sunrise Place subdivision resulted in a landuse planning anomaly regarding the location of the E2 Environmental Conservation/R5 Large Lot Residential zone boundary. The subdivision reflects old property boundary lines, leaving a small area of R5 land between the rear boundary of Lots 101 – 105 Sunrise Place and the existing dam, zoned E2 Environmental Conservation. This anomaly has created the concerns raised in the submission to Council in response to the current application. 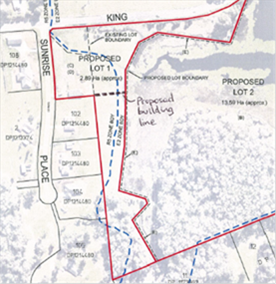 The proposal seeks to amend the boundary of the Sarah’s Crescent property by excising an area of land located on the western side of the dam and adding this area to Lot 101 Sunrise Place. Access to the western side of the dam, while available to the Sarah’s Crescent property, is difficult due to poor access off king Creek Road. Ongoing maintenance (mowing) of that area of land has been undertaken by the property owners along Sunrise Place (being Lots 102, 103 & 104) on a voluntary and informal basis. · 4/7/17 - Application lodged. · 7/7/17 – Application referred to the Rural Fire Service (RFS). · 12/7/17 - 25/7/17 Application publicly notified. · 24/7/17 - Submission received. · 24/7/17 - Site inspection and meeting with objector. · 5/9/17 – Response received from RFS. 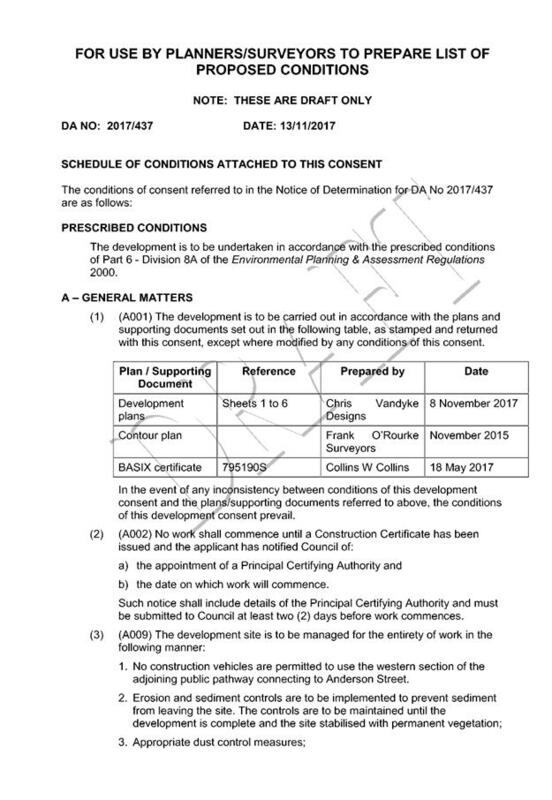 · 6/10/17 - Amended plans submitted. · 19/10/17 - Amended plans sent to submitters. · 8/10/17 - Email advising submissions are not withdrawn. There are no relevant SEPP’s or SEPP’s that will be compromised by the assessment of this application. 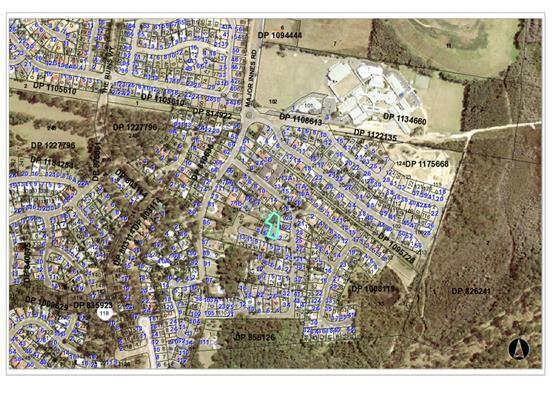 Clause 2.2, the subject site is zoned R5 Large Lot Residential and E2 Environmental Conservation. 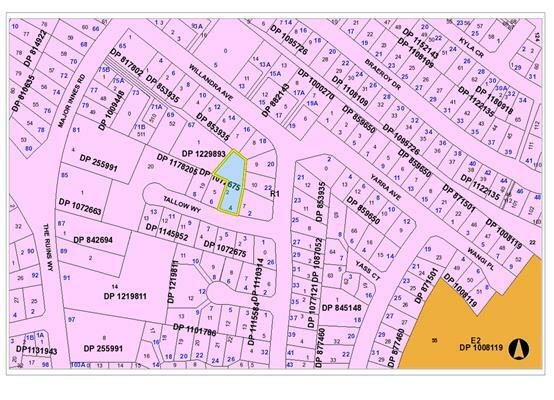 In accordance with clause 2.3(1) and the R5 and E2 zones landuse tables, the proposed development for a boundary adjustment of two lots is a permissible landuse with consent. o To provide residential housing in a rural setting while preserving, and minimising impacts on, environmentally sensitive locations and scenic quality. o To ensure that large residential lots do not hinder the proper and orderly development of urban areas in the future. o To ensure that development in the area does not unreasonably increase the demand for public services or public facilities. · It is noted that Agriculture (as defined in the LEP 2011) and Rural Industries are prohibited use in the R5 zone. There are no landuses permitted within the E2 zone without Council’s consent. 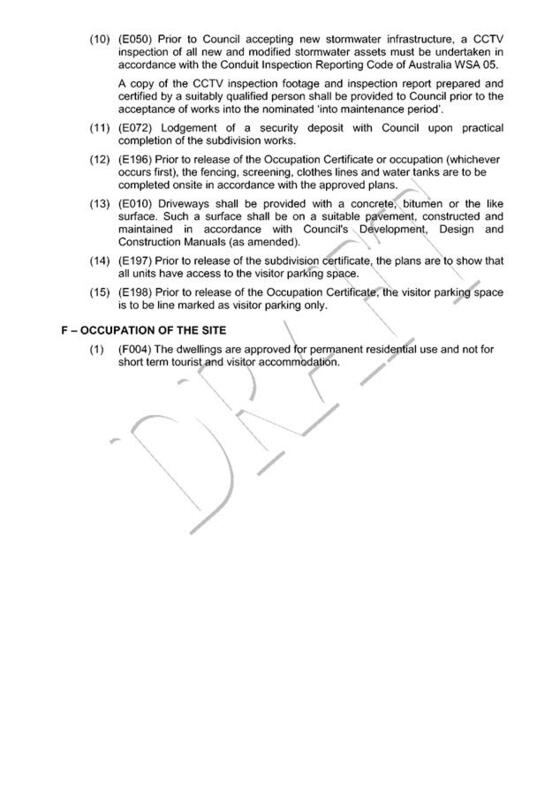 The following uses are permitted with Council’s consent - Environmental facilities; Environmental protection works; Recreation areas; Research stations and Roads. All remaining landuses are prohibited. o the proposed restriction-as-to-user on proposed Lot 1 will assist in protecting the environmentally sensitive land around the existing dam, thereby assisting in the achievement of the protection and enhancement of the E2 zoned land. o The opportunity for a single coordinated approach to the ongoing management of the area on the western side of the dam will assist in the long-term protection of the E2 zone. · Clause 4.1B – minimum lot sizes for split zones. The lot sizes within the proposed boundary adjustment are proposed Lot 1 (2.89ha – an increase from 5,926sqm) and proposed Lot 2 (13.59ha – reduction from 15.89ha). 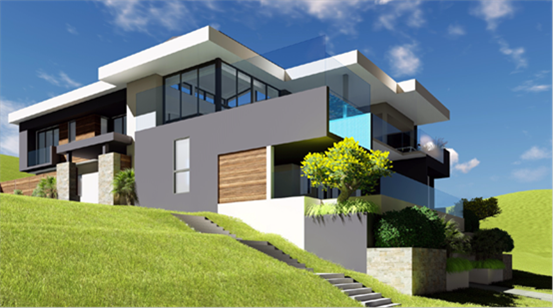 Proposed Lot 1 complies with the minimum lot size in the R5 zone (ie 1.2ha) and contains an existing approved dwelling. Proposed Lot 2 contains an R5 zoned area estimated to be 1.5ha and the remainder is E2 zoned land (containing the dam and surrounding vegetated area). The lots areas are considered to comply with the requirements of Clause 4.1B. 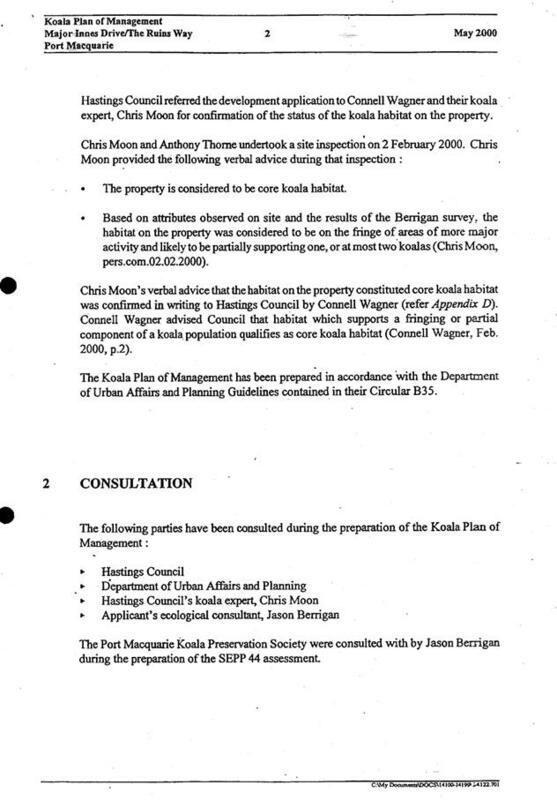 · Clause 7.3 – the site is land within a mapped “flood planning area”. The existing dwellings on each lot are sited above the adopted flood line. The proposal will not increase the flood risk to either property. 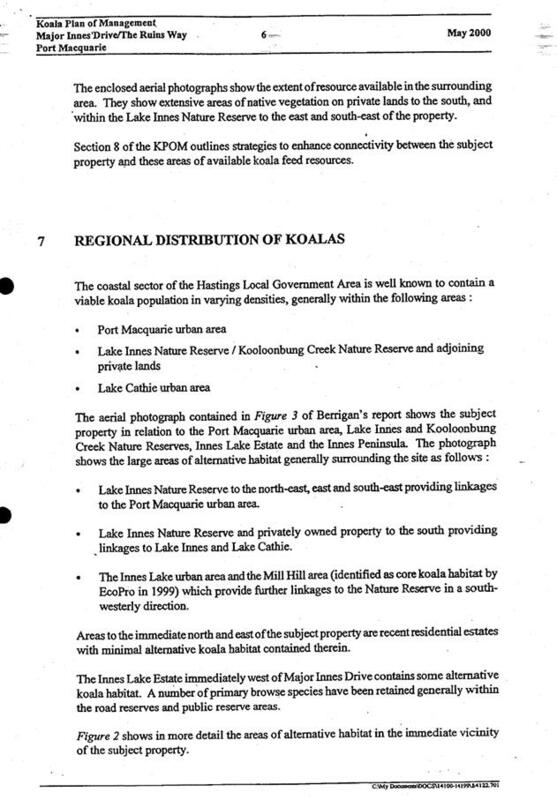 · Clause 7.5 – Koala Habitat – The proposal will not change or adversely impact on the KPOM that applies to this area of King Creek. 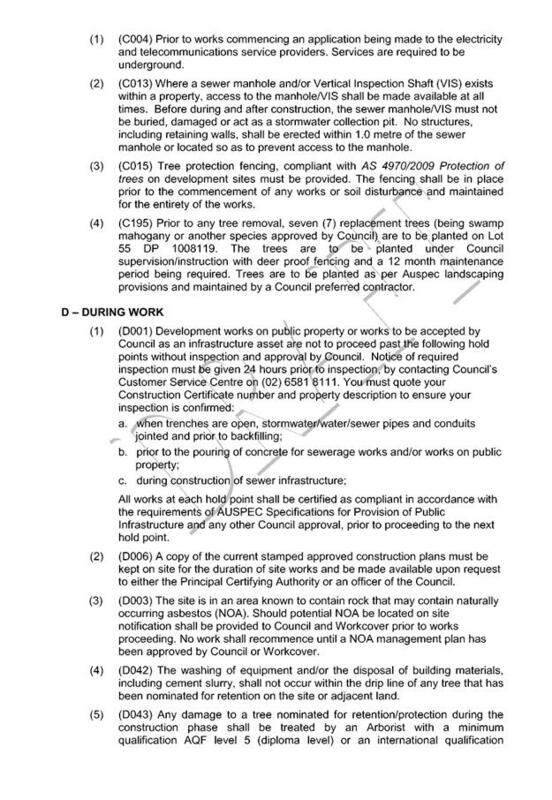 · Clause 7.13 - satisfactory arrangements are in place for provision of essential services to each of the existing lots. No requirements. There are no specific provisions of DCP 2013 that apply to the proposed boundary adjustment. Therefore, the application is assessed against the applicable heads of consideration under S79C of the EP&A Act, 1979. The owner of the lot benefitted by this easement may have access to water stored within the dam within Lot 1 adjacent to the common boundary with Lot 2 for the purposes of domestic purposes, stock watering and crop irrigation. (c) carrying out work within the site of this easement, such as constructing, placing, repairing or maintaining a pump and lines of pipes. (e) make good any collateral damage. 2. The land within the dam, including the water body, is zoned E2 Environmental Conservation. No landuses are permissible in the E2 zone without Council’s consent. An easement and/or covenant should not seek to circumvent the requirements of the local planning instrument. 3. 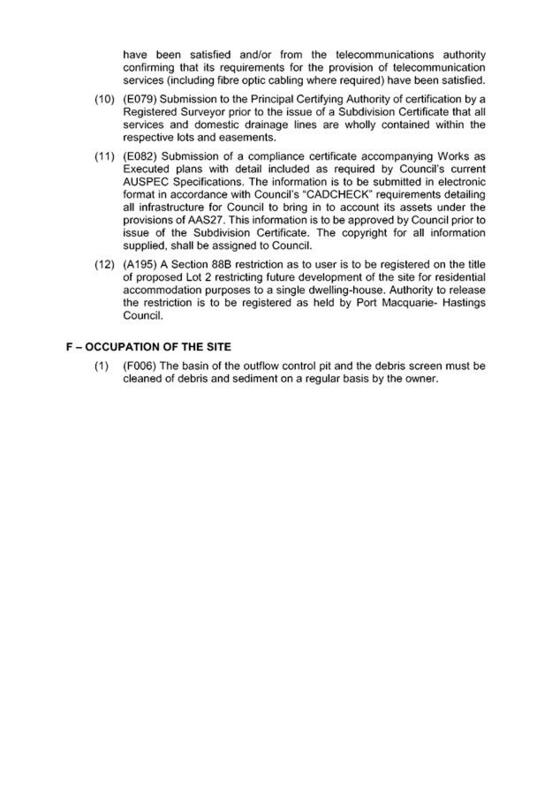 The prescribed authority for this easement would be Port Macquarie-Hastings Council. Council should not accept this authority for actions that would be contrary to their local planning instrument and objectives of the environmental conservation zone. 4. Notwithstanding the above points, the terms of the easement, as proposed, are subjective and unable to be readily monitored or regulated. The use of words/ phrases such as ‘anything reasonably necessary’, ‘done properly, ‘as little inconvenience as is practicable’ and ‘as little damage as is practicable’ cannot be substantiated by either landowner in the future, notwithstanding any amicable relationship between current property owners. 3. The area creates a buffer area between the existing R5 properties and the edge of the water within the E2 zone. 4. The retention of an unencumbered area of R5 zoned land on the eastern side of proposed Lot 1 provides the property owner with additional space for their domestic occupation without impacting on Lots 102, 103 & 104 to the south. 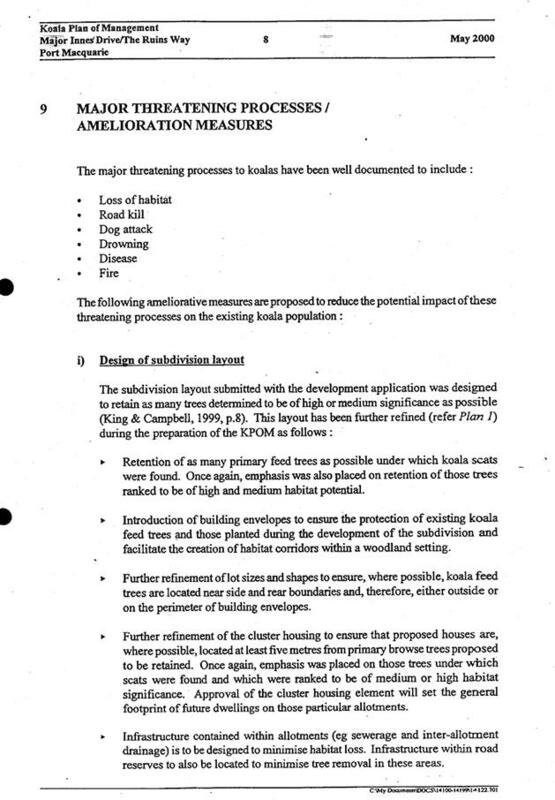 ‘a) no vegetation shall be removed or firewood collected from the lot burdened with the area marked (B) on the plan. As existing for both allotments. No requirements. Stormwater from buildings on Proposed Lot 1 drain to Sunrise Place. Proposed Lot 1 will not own the water body, therefore the risk of any stormwater being drained to the dam is considered remote. The two lots are existing and do not support any significant agricultural resource. The proposed boundary adjustment will not sterilise any significant mineral or agricultural resource. No adverse impact, boundary adjustment only. 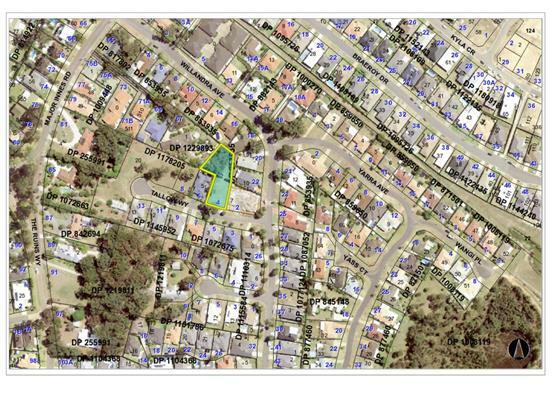 Part of the land proposed to be added to the Sarahs Crescent lot is identified as being bushfire prone. The application was referred to the NSW Rural Fire Service for comment. The Service responded on 5 September 2017, with no comments or specific conditions. No adverse impacts anticipated, subject to the inclusion of a condition of consent restricting future building between the rear of Lots 102, 103, 104 & 105 and the dam. One submission was received which raised potential negative economic impacts of the proposal on the neighbours that back onto the land and the dam. It is understood that the objection is to the potential extension of the current domestic occupation or any future rural-based business onto the R5 zoned land and therefore potential for future buildings to be placed on the newly attained R5 portion of land. While there is no evidence or application for such a development at this time that substantiates this concern, the R5 zone over this land is considered a landuse planning anomaly. The E2 Environmental Conservation zone should be extended up to the rear of Lots 102, 103 & 104 and 105, thereby providing a buffer area around the dam to maintain it in its natural state and reduce the risk of contamination into the water body. 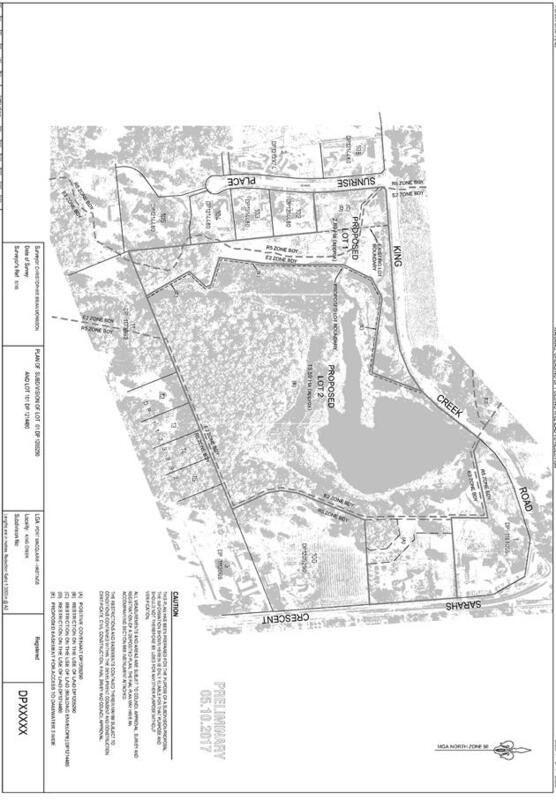 It is proposed to include a condition of consent requiring a Section 88B covenant on the title of proposed Lot 1 creating a building line restriction behind the southern boundary of this site off Sunrise Place and the dam. 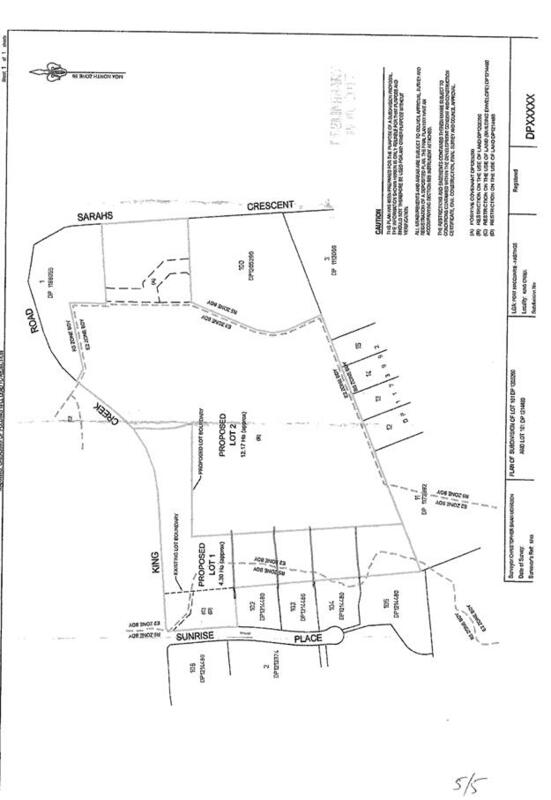 This building line allows the owner of proposed Lot 1 to use the R5 zoned land immediately east of their existing dwelling and shed as an extension of their current domestic occupation of the land (subject to any relevant approvals) but not permit buildings behind Lots 102 – 104 and the dam. This does not negate the owner of proposed Lot 1’s responsibility to maintain that land or from undertaking any (approved) environmental protection works adjacent the dam (within the E2 and R5 zoned area). The proposed development is not expected to have any adverse cumulative impacts on the natural or built environment or the social and economic attributes of the locality, subject to inclusion of the proposed conditions of consent (Section 88B covenant – building line). Site constraints of bushfire, the E2 Environmental Conservation zone, flood prone land and ongoing management of the land have been adequately addressed and appropriate conditions of consent recommended. 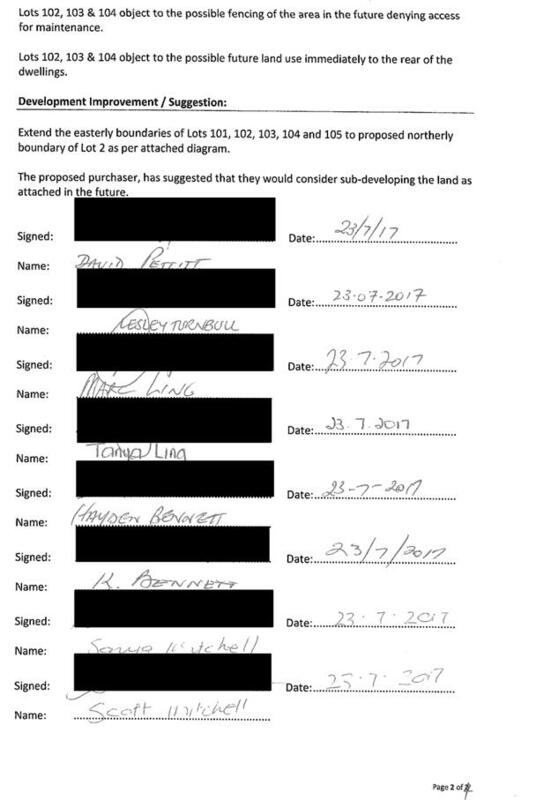 One (1) written submission, containing the signatures of six (6) property owners has been received following public exhibition of the application. The proposal will have a negative economic impact to existing properties in Sunrise Place (exception of Lot 101). There is no evidence that the proposal will have a negative impact. Notwithstanding, the proposed condition of consent restricting any new building being constructed between the rear of the lots and the dam addresses this concern. The proposal is not in the best interest of the public as it will allow possible expansion in the future of the commercial business that is currently run from the shed on Lot 101. This is a point of speculation on behalf of the objectors. There is no evidence to substantiate this claim. Notwithstanding, the proposed conditions of consent include conditions addressing access to the dam, proposed building line and protection of the E2 Environmental Conservation zone. Lots 102, 103 & 104 object to the possible fencing of the area in the future denying access for maintenance. The matter of fencing will be resolved between the individual property owners. Future maintenance of the area between the rear of Lots 102, 103 & 104 and the dam will be the responsibility of the future owners of the land, not the adjoining neighbours. Therefore access for maintenance purposes they currently undertake on an informal, voluntary basis will not be required. Lots 102, 103 & 104 object to the possible future land use immediately to the rear of the dwellings. The R5 zoning of this area is considered a landuse planning anomaly created as a result of property boundary lines at the time of subdivision of Sunrise Place. It is proposed that a condition of consent be included in any development consent issued by Council requiring a Section 88B restriction of the title of the land creating a building line that prevents building/s being constructed between the rear of Lots 102, 103, & 104 and the water body. This allows the new owners of the land to maintain and enhance the E2 Environmental Conservation zoned land but not to build upon the R5 zoned land behind Lots 102 – 104. Nil. No additional lots are created as a result of this application. 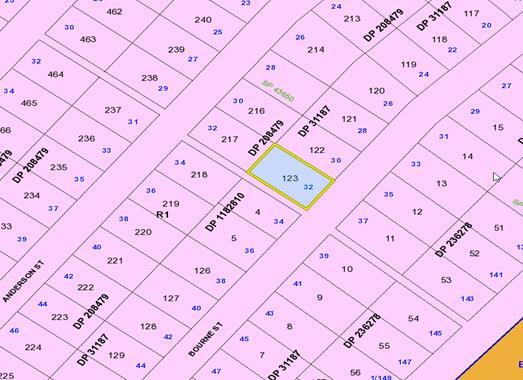 That DA2017 – 820.1 for the subdivision of two lots into three lots at Lots 1 & 5, DP 24963, No. 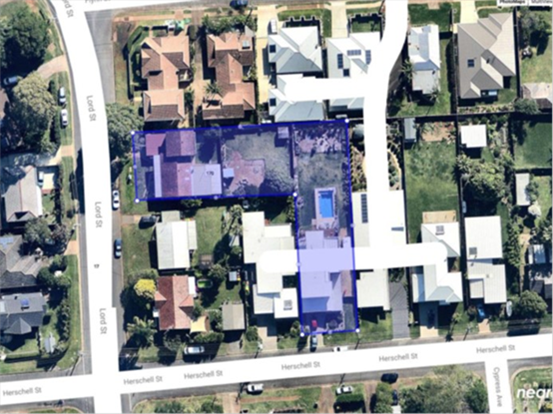 17 Herschell Street and 170 Lord Street, Port Macquarie, be determined by granting consent subject to the recommended conditions. This report considers a development application for a subdivision of 2 lots into 3 lots at the subject site and provides an assessment of the application in accordance with the Environmental Planning and Assessment Act 1979. Following exhibition of the application, two (2) submissions have been received. One submission was in support of the application. The development site has a combined area of 1,858.4m2. 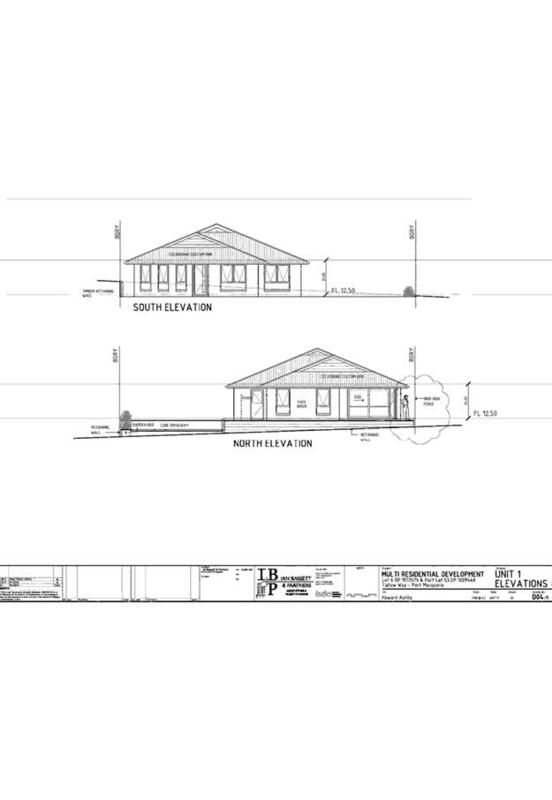 · The two existing lots contain a single dwelling house on each lot. 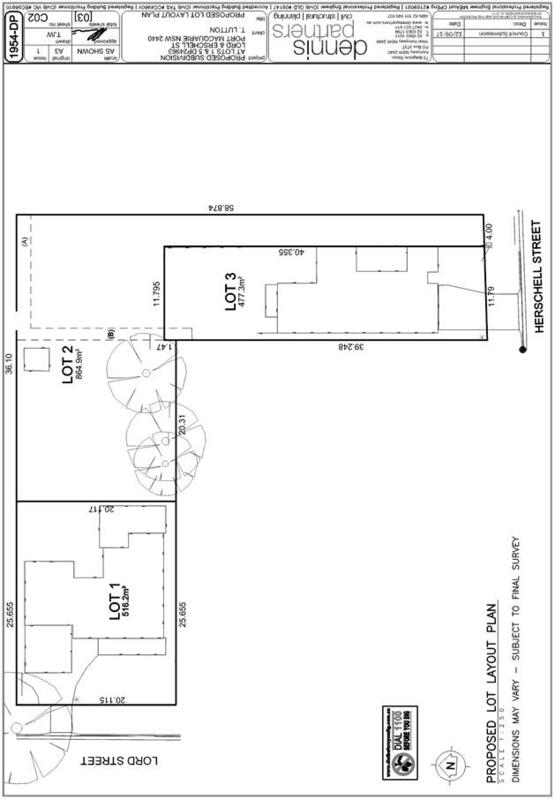 · Access to the rear lot is via a proposed access handle 4m wide. Masterplan requirements of SEPP 71 are not triggered as the site is not within a sensitive coastal location. · Clause 2.2, the subject site is zoned R1 General Residential. 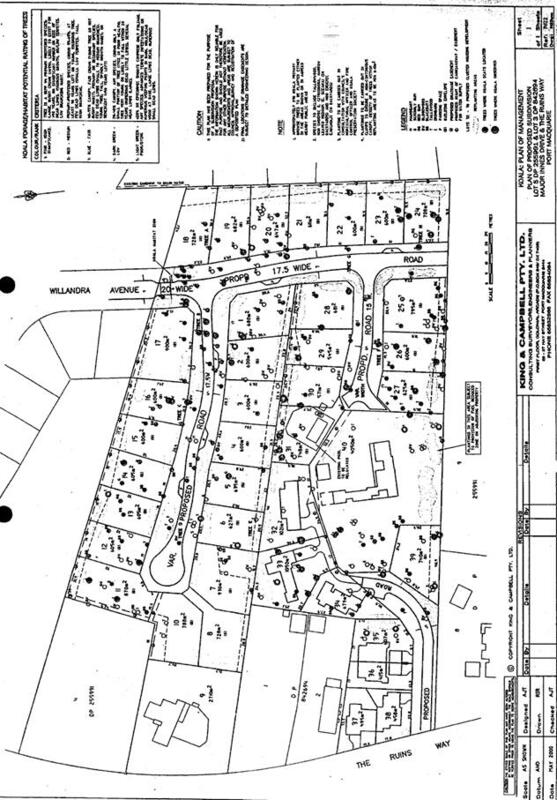 In accordance with clause 2.3(1) and the R1 zone landuse table, the proposed development for a subdivision (two lots into three lots) is a permissible landuse with consent. 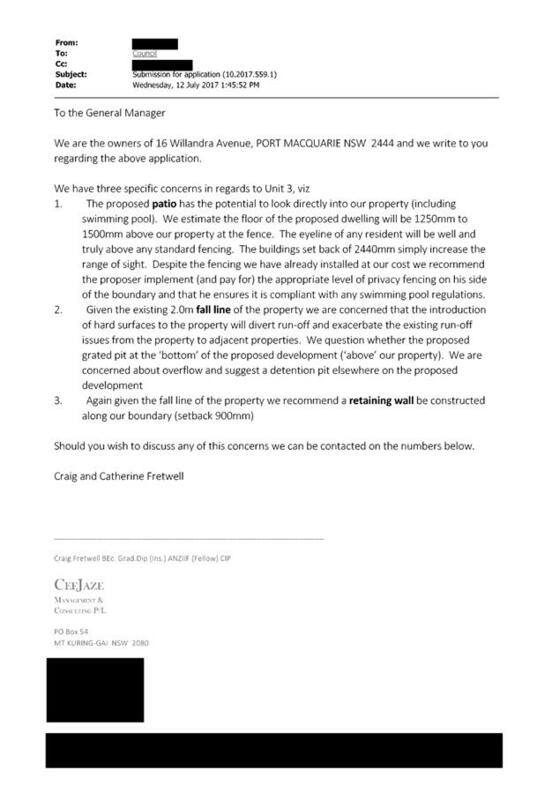 o the proposal creates one additional residential lot which adds to the housing potential within the inner urban and coastal area of Port Macquarie. 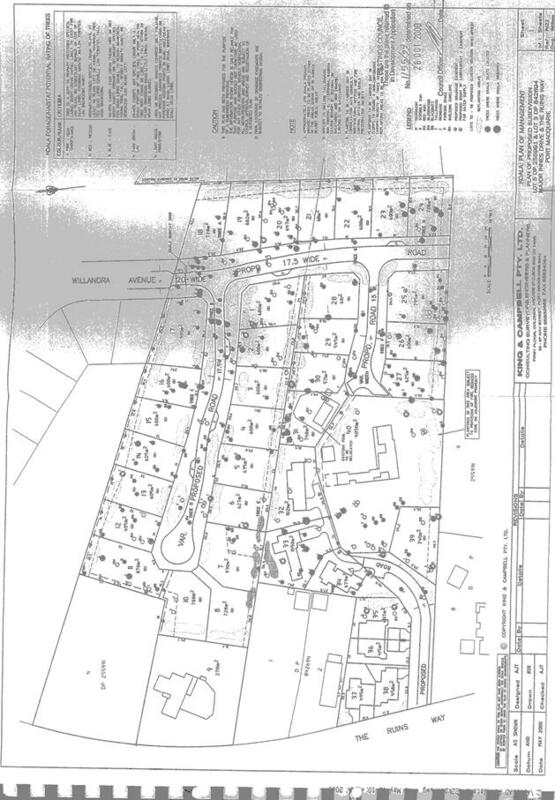 · Clause 4.1 - the lot sizes within the proposed subdivision are proposed Lot 1 – 516.2m2; proposed Lot 2 – 864.9m2 and proposed Lot 3 – 477.3m2. 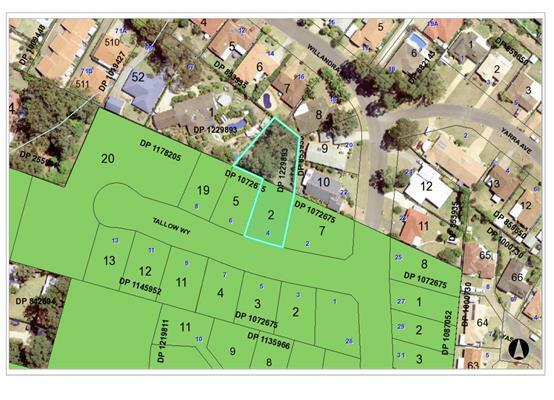 All proposed lots comply with the minimum lot sizes (450m2) identified in the Lot Size Map relating to the site. 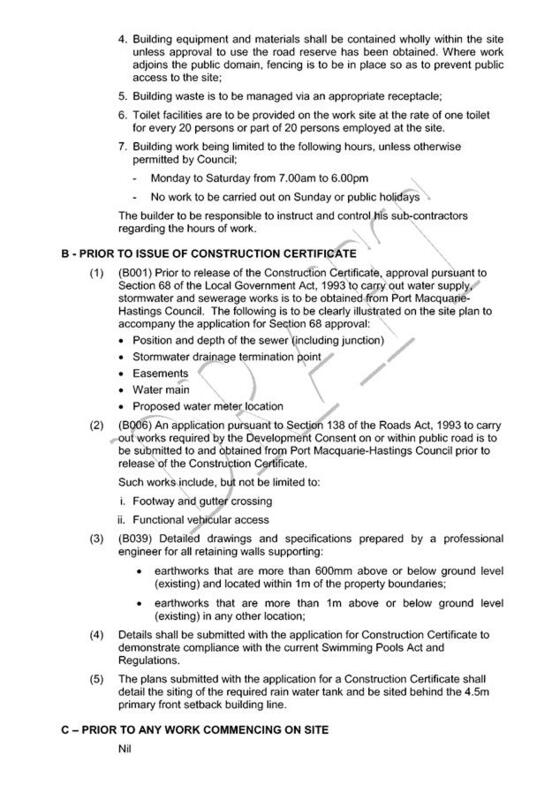 · Clause 5.5 - Development within the coastal zone (relevant objectives of this clause are addressed by SEPP 71 section - see above). · Clause 5.9 – No listed trees in DCP 2013 are proposed to be removed. One tree is to be removed. It is not a significant tree. Its removal is permitted within the terms of this application. · Clause 5.10. The site does not contain or adjoin any known heritage items or sites of significance. A site analysis is required for all development. The site survey is adequate for this application. The subject site is located within an existing urban area. A battle axe handle access arrangement is the only viable option for future development of the rear of the subject properties. 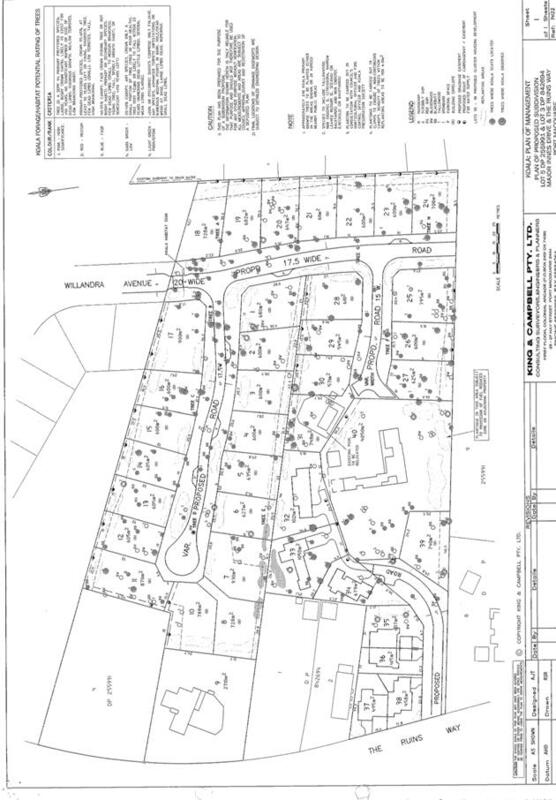 It is noted two previous development consents have approved a secondary dwelling (DA 2014/779) and subdivision of existing Lot 5 (now proposed Lots 2 & 3 of this DA) into two lots DA2015/171). Therefore, this subdivision does not intensify the traffic generation over and above previous Council approvals. The new crossover to Herschell Street does not reduce the amenity of the street. It will reduce on-street parking by one space, however, this has previously been approved. It is acknowledged that the adjoining property owner to the east has made a submission to the application based on traffic generation of proposed Lot 2. This is addressed below. There is an existing stormwater and sewer easement that traverse proposed Lot 2 that serves both proposed Lot 2 and proposed Lot 3. The access handle of proposed Lot 2 provides sufficient room for garbage collection (being two bins on a fortnightly rotation). Utilities can be provided to service proposed Lot 2. The size of proposed Lot 2 is sufficient to accommodate a typical dwelling building envelope (10x15m) plus turning area for vehicles to enter and leave that lot in a forward direction. 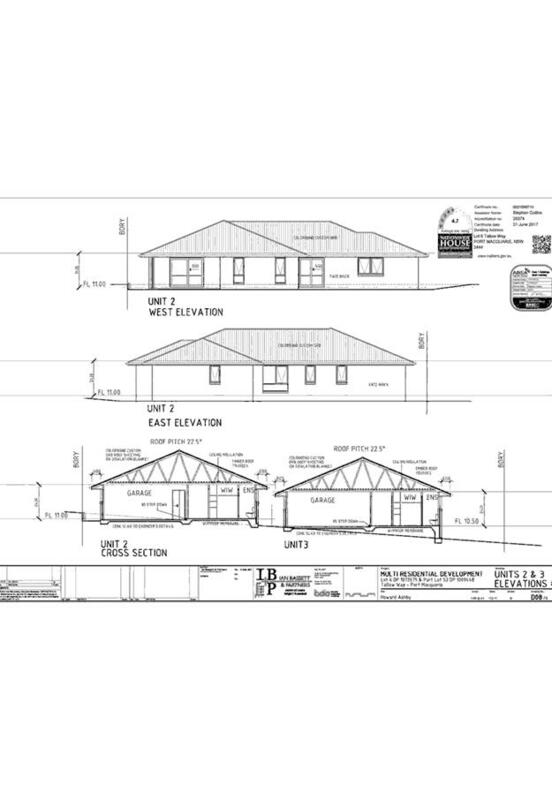 An average dwelling building envelope is able to be constructed on proposed Lot 2 without requiring more than 1m cut. Proposed Lots 1 & 3 are occupied by existing single dwellings. 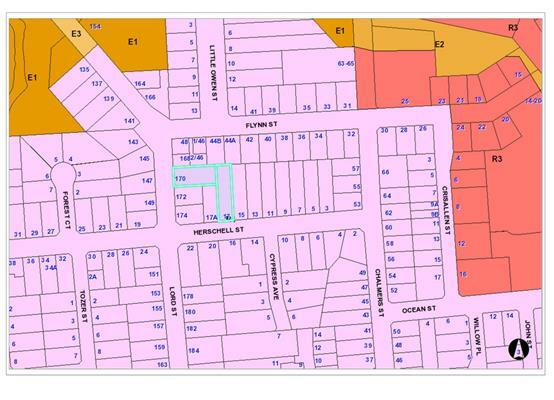 Lot 1 is oriented to Lord Street (east/west) and Lot 3 (north/south) is oriented to Herschell Street. Proposed Lot 2 provided is east west. Proposed Lot 2 is accessed from Herschell Street with its building platform with an east/west orientation. This allows good access to east and north-west orientation for outdoor areas and solar access to these areas. 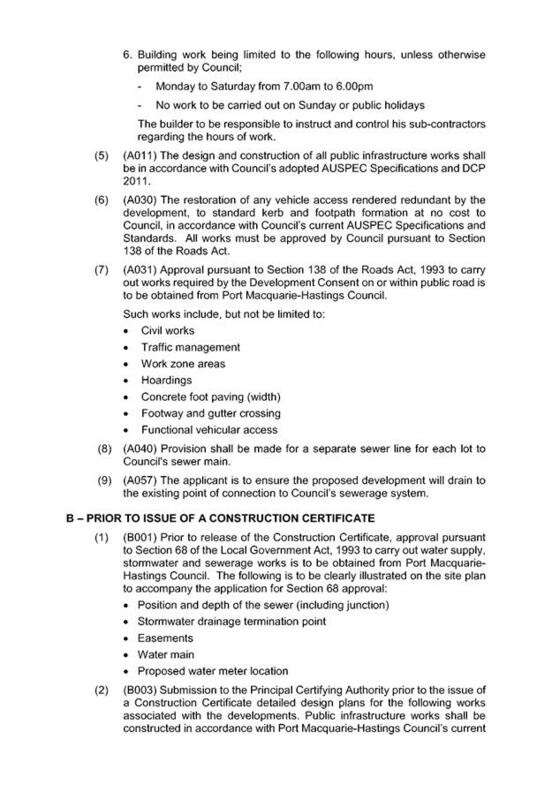 Conditions of consent to apply regarding crossover, kerb and guttering for proposed Lot 2. No change to Lots 1 & 3 that have existing crossovers and driveway to existing single dwellings. Conditions of consent to apply. Capable of complying. Reclaimed water is not available in this area of Port Macquarie. Capable of complying. Condition of consent to apply. Electricity connection to proposed Lot 2 is to underground, along the access handle. None required for this application. The proposal is consistent with the objectives and principles contained in the NSW Coastal Policy. The subject site is an L-shaped site currently comprising of two lots with access to Lord Street and Herschell Street respectively. Adjoining the site to the north is a mix of single and medium storey low-rise dwellings on Lord and Flynn Streets. Adjoining the site to the east and west are single dwellings of a variety of ages and architectural styles reflecting the time of their construction and long-term upkeep. Adjoining the site to the south is predominantly medium density development. The proposal, being subdivision of the land, will be unlikely to have any adverse impacts to existing adjoining properties and satisfactorily addresses the public domain. The subject site has street frontages to Lord Street to the west and Herschell Street to the south. Both roads are owned and maintained by Council. There is no change to the existing Lord Street frontage (proposed Lot 1), access or services. Herschell Street is classed as a local Council Collector Road. It has an 11m wide carriageway within a 20m wide road reserve. The road is bitumen sealed and bordered on both sides by upright (SA) type kerb and gutter. A medium strip traffic management device is location to the west of the site, at the intersection of Herschell St and Lord St. There is no concrete footpath along either side of Herschell Street in this location. 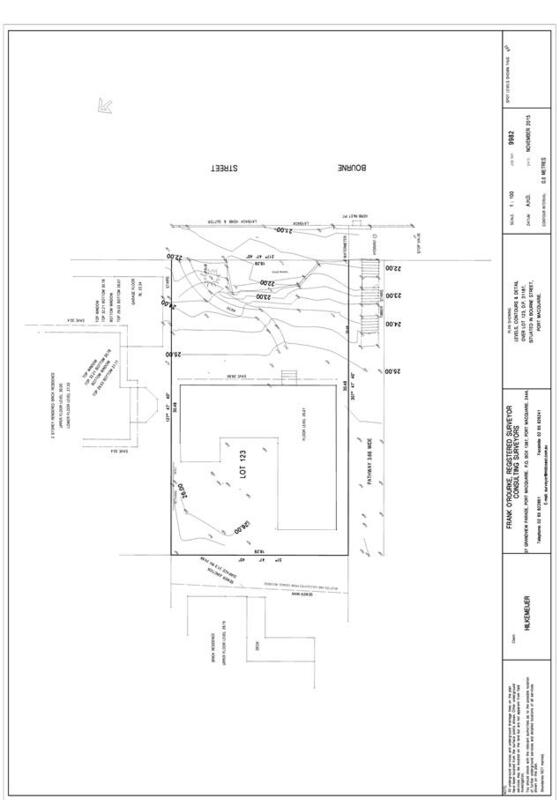 There is no change to the existing crossover or driveway to Herschell Street proposed Lot 3 (existing dwelling). The new crossover and access handle to proposed Lot 2 (new rear lot) is located 60-65m east of the intersection of Herschell Street and Lord Street. There are adequate site lines in each direction from the new driveway. The applicant has proposed the application of a s88B restriction on proposed Lot 2 to ensure that traffic generation into and out of proposed Lot 2 is restricted to a single dwelling. That is, not more than one dwelling on the site that could potentially be occupied by separate property owners/tenants. The aim of this restriction is to limit the traffic generation from proposed Lot 2, thereby not requiring a passing bay along the access handle. While zoning and future applications will govern what is ultimately allowed on proposed Lot 2, the proposed restriction is considered reasonable in this case and Council staff do not object to its imposition. 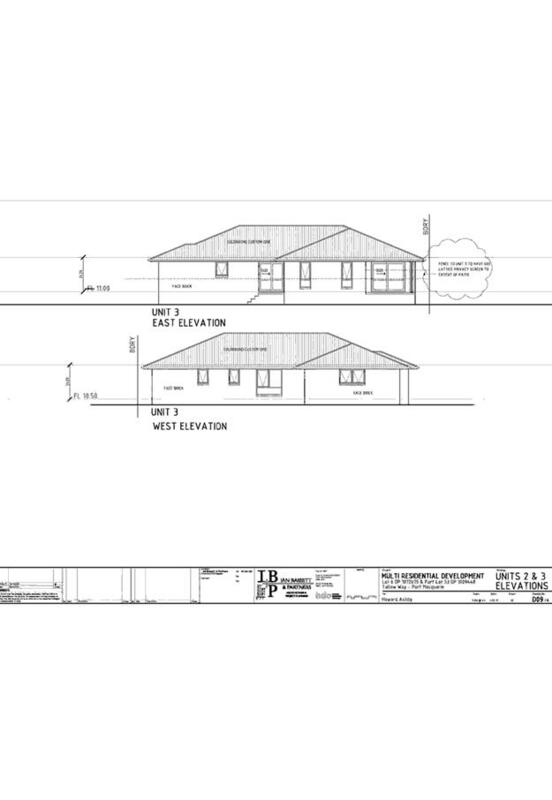 The restriction to a single dwelling will also assist in addressing the neighbours’ concern about traffic generated from the new lot and onto Herschell Street. Two existing development approvals are of note in relation to servicing and access arrangements for the land. 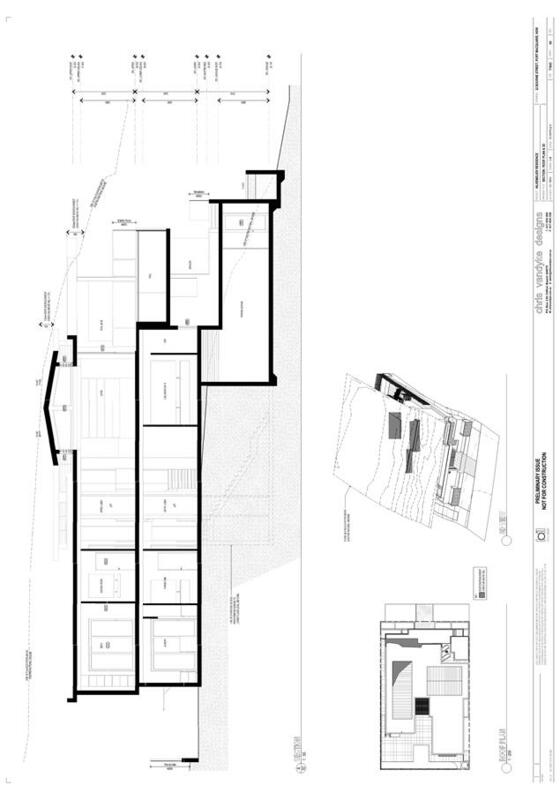 DA 2014/779 – included the construction of a two bedroom secondary dwelling at the rear of the approved 4+ bedroom primary residence fronting Herschell Street. This consent approved a driveway to the secondary dwelling in the same location as the access handle of the current proposed Lot 2. No objection to the driveway or traffic generation were raised at that time. 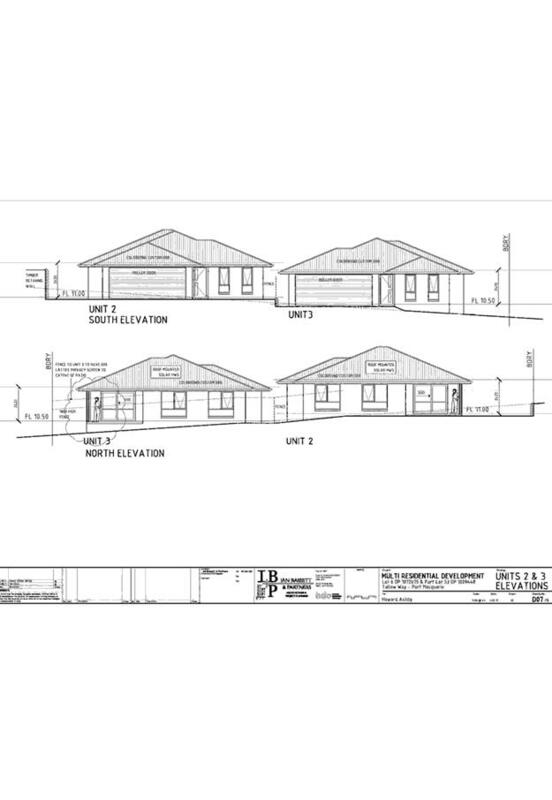 The driveway is now 4m wide, providing sufficient access for the proposed new torrens title lot and a standard single dwelling on proposed Lot 2. This application is comparable to Council’s previous approval in relation to traffic generation and services. Council’s engineers advise that no special conditions are required in regard to servicing. Traffic intensification from the currently approved secondary dwelling and the proposed torrens title lot is considered minor. DA 2015/171 - approved a two-lot subdivision with a very similar battleaxe access arrangement to Herschell Street for a rear lot. This DA is still active. 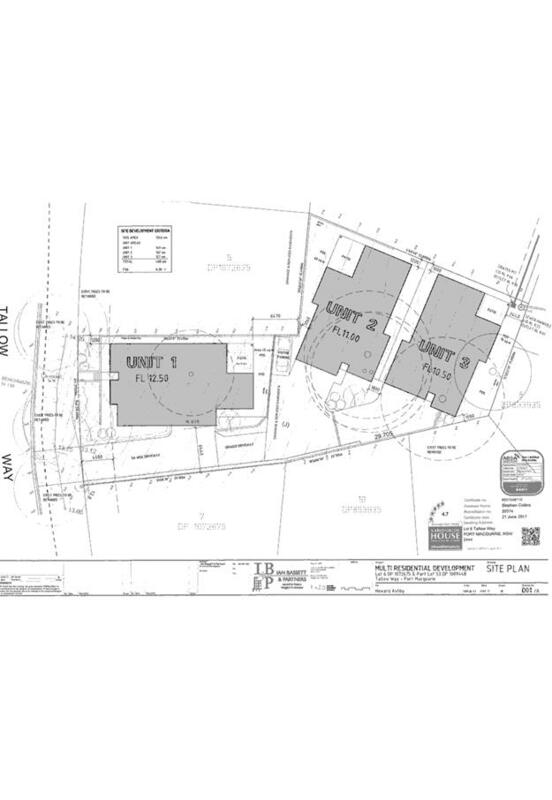 Therefore, the current DA is effectively a boundary adjustment at the rear to provide more area for proposed Lot 2. As there is no conflict for servicing purposes between DA 2015/171 or the current proposal, surrender of the existing DA is not required. Vehicle access to the two existing dwellings onsite will be via the existing driveways to Lord Street and Herschell Street respectively. A third access for proposed Lot 2 was previously approved via a 4m wide battleaxe handle under DA 2014/779 and 2015/171. While the minimum dimension for such a driveway is 3.6m (AS2890), the applicant proposes to restrict proposed Lot 2 to a single dwelling to ensure no future requirement for passing of unrelated vehicles is accepted in this case. The intensification on Herschell Street is previously approved with no requirement for footpath paving. Each existing dwelling has onsite parking for two vehicles. There are no proposed changes to this arrangement for either dwelling. Parking for any development of proposed Lot 2 will be required to be demonstrated as part of any future DA. There is sufficient space within proposed Lot 2 for parking to comply with Council’s DCP. Parking and driveway widths on site will also be able to comply with relevant Australian Standards (AS 2890) and enable vehicles to enter and leave in a forward direction. 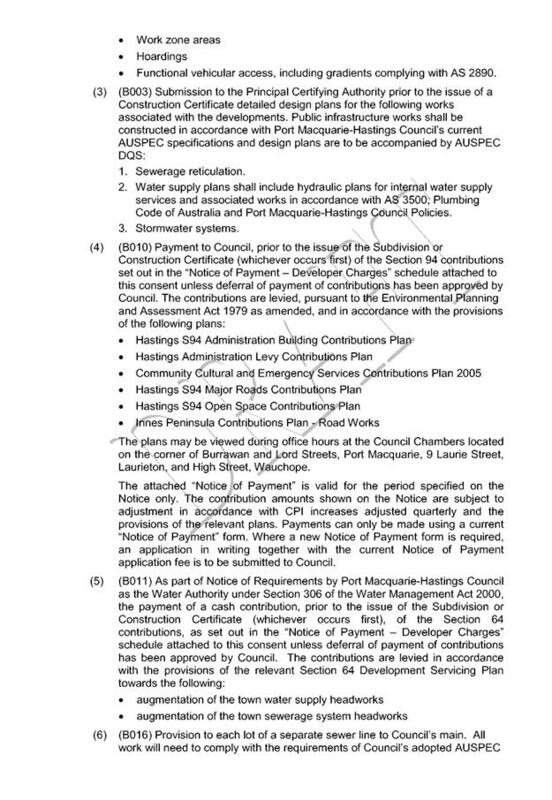 Council records indicate that the development site has two existing 20mm metered water services. Each proposed lot requires an individual sealed water service. 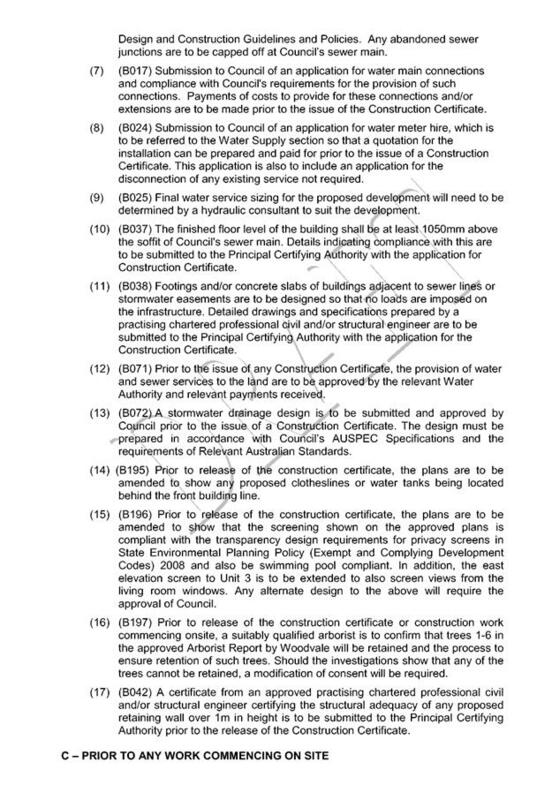 The engineering plans submitted with the development application are acceptable for Water and Sewer Section purposes. Standard conditions of consent to apply. 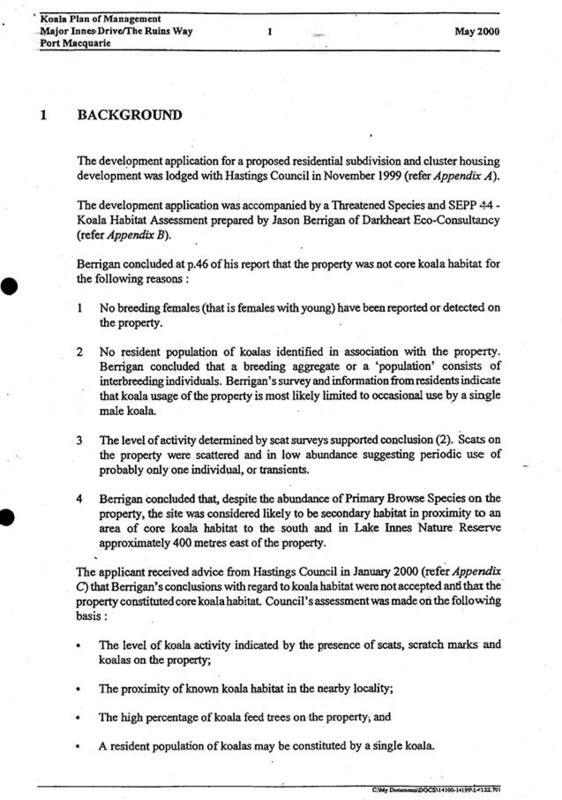 Council records indicate that the development site is connected to Sewer via a sewer main that traverses the site. Each proposed lot requires an individual sewer junction. Any redundant internal sewer lines must be redirected to the new point of connection to Council’s sewer system for the lot. Refer to relevant conditions of consent. The site naturally grades towards the north (rear) and is currently serviced via an existing inter-allotment drainage system which was constructed as part of the previous subdivision of land. 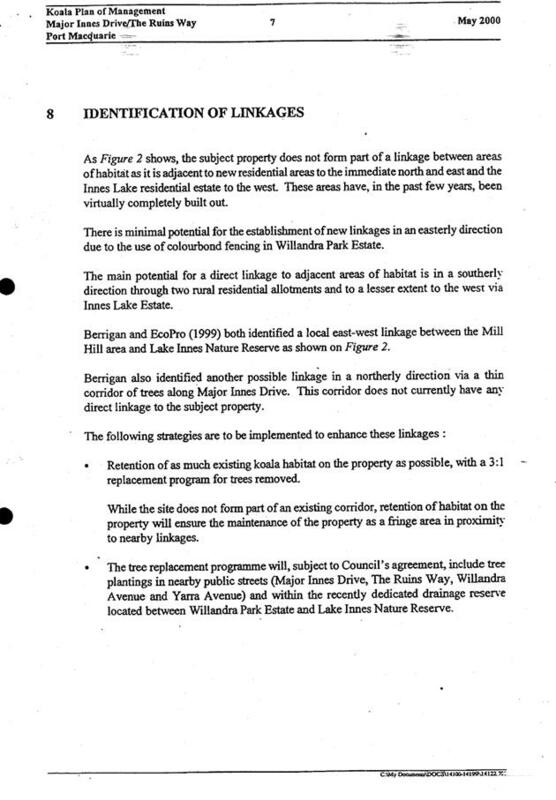 The legal point of discharge for the proposed development is defined as a direct connection to the existing inter-allotment drainage system for each proposed lot. This can be achieved by cutting new junction(s) into the existing system (with approval). Telecommunication and electricity services are available to the site. Evidence of satisfactory arrangements with the relevant utility authorities for proposed Lot 2 will be required prior to release of the Subdivision Certificate. 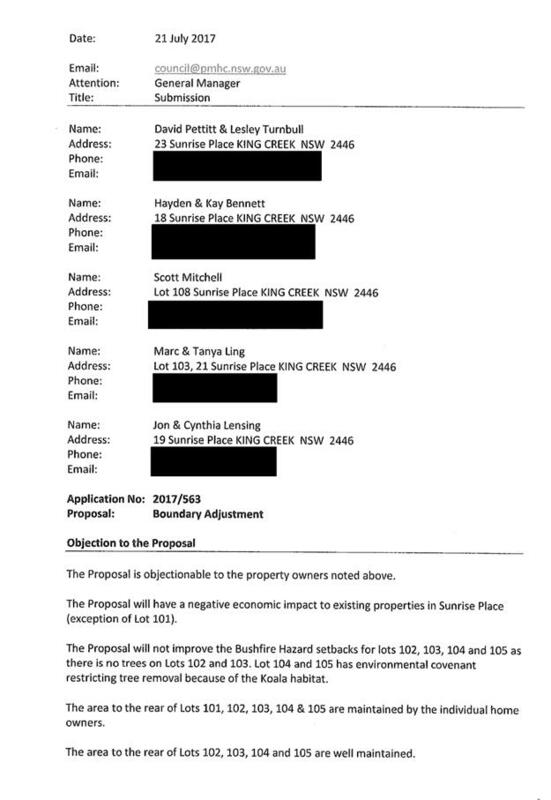 The subject site is not a listed heritage item, located within a heritage conservation area or in the vicinity of any heritage item. No adverse impacts anticipated. No significant trees to be removed as a result of the subdivision of the land. Satisfactory arrangements are in place for the existing dwellings. Proposed Lot 2 is capable of providing sufficient area at the front of the site for garbage collection in accordance with Councils standard waste collection for a single allotment. Two (2) written submissions have been received following public exhibition of the application. One submission was in support of the application. An access handle along the same alignment as the proposal has previously been approved to provide access to two developments, one being a secondary dwelling and the second being a subdivision of the land fronting Herschell Street into two lots – the rear lot being 450m2 with 4m driveway. The applicant has proposed a s88B restriction on proposed Lot 2 to restrict future development on that lot to a single dwelling. This would reduce the amount of traffic and prevent the requirement for passing of unrelated vehicles along the access handle. It is proposed to apply the s88B. This will reduce any future impact to a level less than permissible with current development consents. This is considered a positive outcome for the objector. Support the imposition of positive convenient restricting rear lot to single dwelling only. Should No. 170 become vacant, then DA for development across two properties, not complying development. 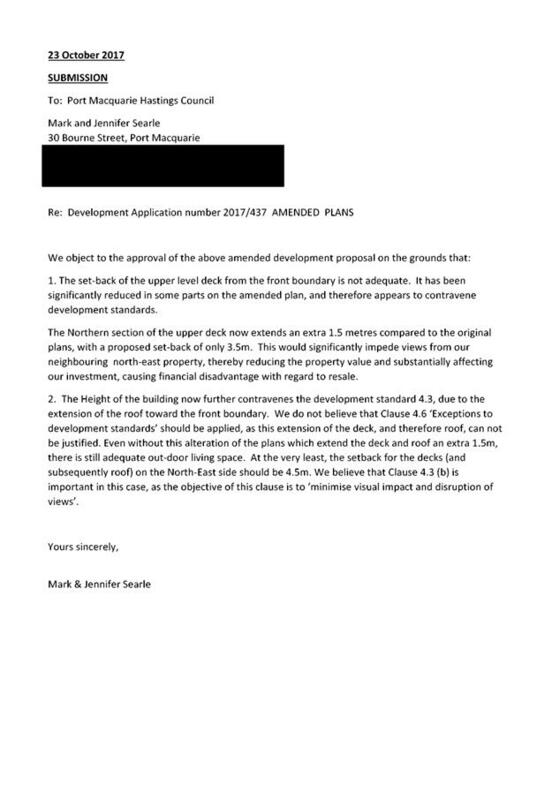 This is not an objection to the current proposal.. Any development across the two lots with access off Lord Street, for more than one dwelling would require the submission of an application. That DA2017 – 437.1 for demolition of existing dwelling and construction of new dwelling and swimming pool including clause 4.6 objection to clause 4.3 (height of buildings) at Lot 123, DP 31187, No. 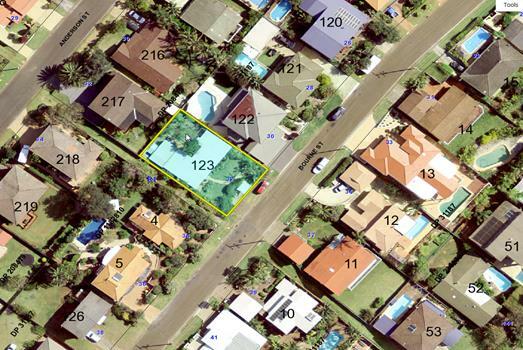 32 Bourne Street, Port Macquarie, be determined by granting consent subject to the recommended conditions. This report considers a Development Application for demolition of existing dwelling and construction of new dwelling and swimming pool at the subject site and provides an assessment of the application in accordance with the Environmental Planning and Assessment Act 1979. This matter is being reported to the Development Assessment Panel due to one (1) submission being received in regards to the proposal. The proposal has been amended during the assessment of the DA to respond to assessment issues. 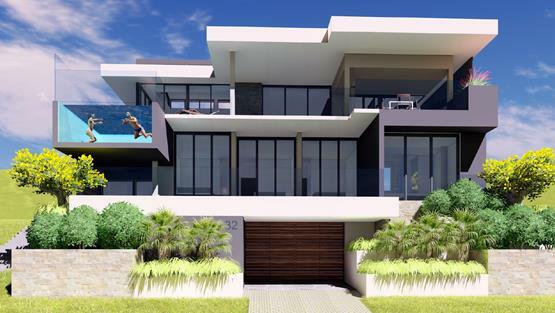 This has included an increase in setback to the garage door, elevated swimming pool, modifications to design of the retaining walls and garage walls fronting the street and a minor reduction of the building height. The proposal has been neighbour notified on two occasions. Following exhibition of the application, one submission has been received on two occasions. The proposal includes a proposal to vary the 8.5m building height standard applying to the site. The variation is within 10% and as such the Development Assessment Panel has delegations to determine the DA. 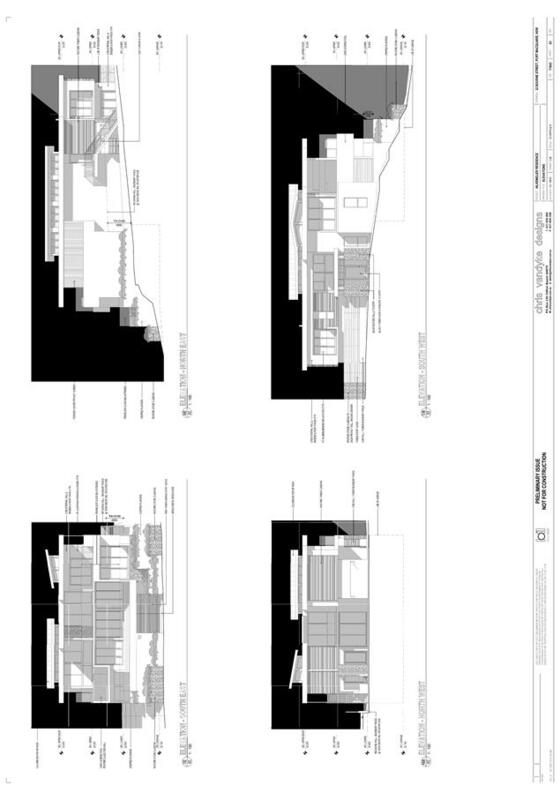 There are several variations proposed to the Development Control Plan 2013 performance based Development Provisions however all variations are considered to be justifiable given the site attributes and context together with the relatively unique building design response to accommodate a relatively large dwelling on the site. The site has an area of 557.5m2. The site is occupied by an existing dwelling. There is no off street parking spaces on the site. The site slopes upwards from Bourne Street in a steep manner for the first eastern half of the site then flattens out to a moderate slope for the remainder of the western portion including the current benched area where the current dwelling is sited. There is an existing public pathway running along the southern boundary of the site connecting between Bourne Street and Anderson Street. The locality can be characterised as having primarily large detached homes some up to 3 storeys in height and with a variety of design responses to site slope in the immediate locality. There is several modernised and completely new dwellings in Bourne Street. 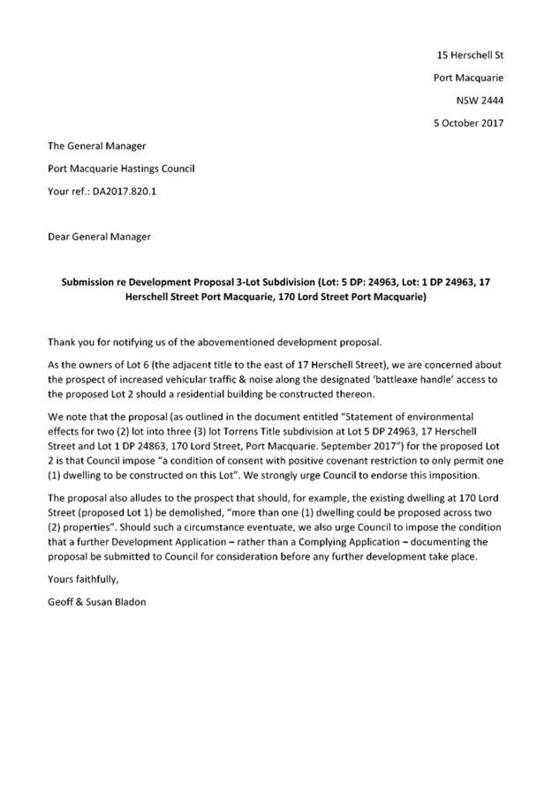 Important for noting is that the site is within a precinct which has a floor space ratio of 1:1 under the Port Macquarie-Hastings Local Environmental Plan 2011. · Construction of new dwelling and elevated swimming pool including retaining walls and removal of trees on the site. · 6 to 20 June 2017 – Neighbour notification of proposal (original submitted plans). · 28 June 2017 – Additional information requested - concerns with front setbacks including elevated swimming pool, garage setbacks, retaining walls, clarification of access from adjoining public pathway on south side and submission issues raised. · 17 July 2017 – Draft sketch plans submitted for consideration to resolve assessment issues. · 21 July 2017 – Advised Applicant that more changes are recommended to plans. · 10 August 2017 – Meeting with Applicant to discuss assessment issues. 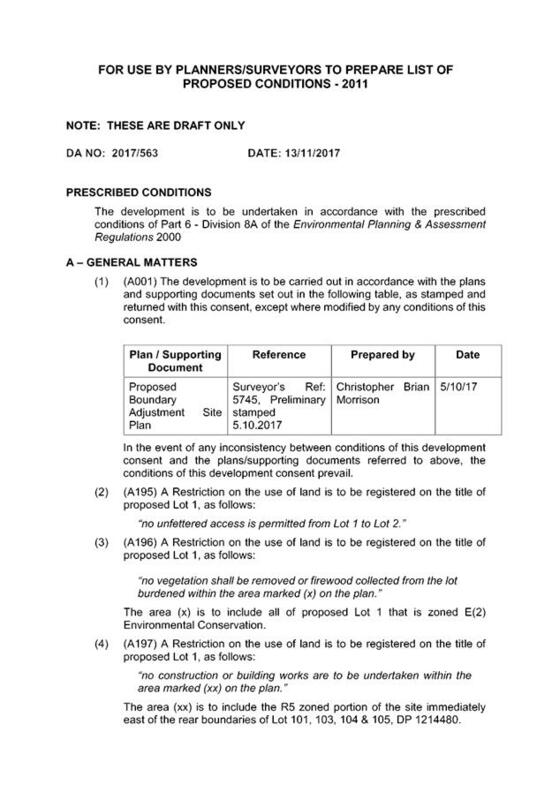 · 7 September 2017 – Additional discussion with Applicant to resolve amendments required to plans. 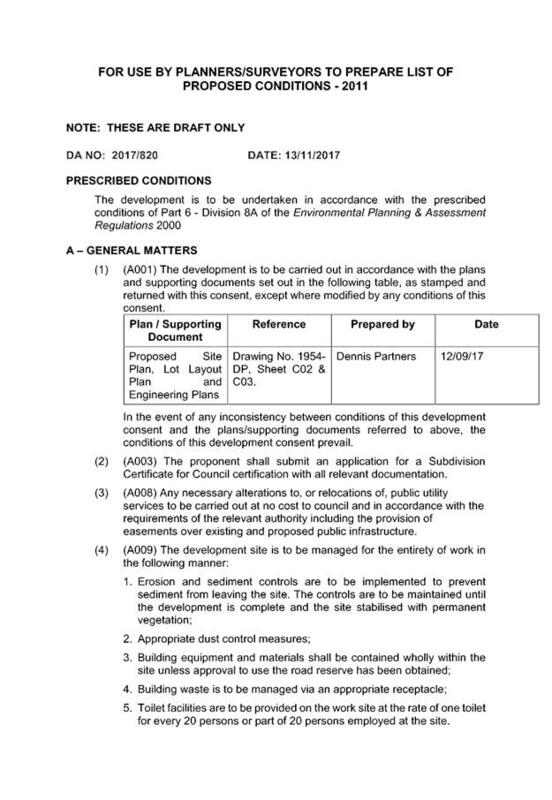 · 27 September 2017 – Amended plans received from the Applicant. · 10 to 23 October 2017 – Neighbour notification of amended plans. · 7 November 2017 - Additional discussion with Applicant to resolve amendments required to plans. · 8 November 2017 – Amended plans and additional information received from Applicant to clarify articulation zone for front setback. 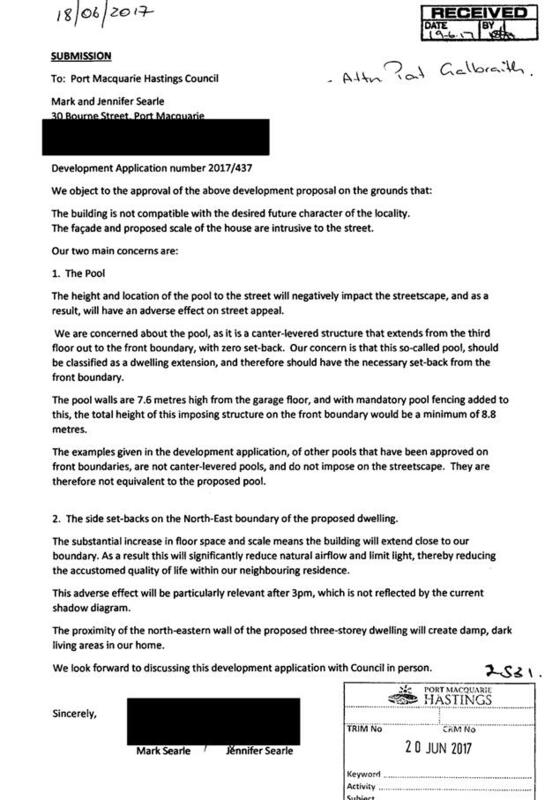 · 10 November 2017 – Additional survey information received from Applicant to establish the existing floor levels of the neighbouring no.30 Bourne Street. · 14 November 2017 – Additional levels information received from Applicant. Given the nature of the proposed development and proposed stormwater controls, the proposal will be unlikely to have any adverse impact on existing aquaculture industries. The site is located within an area zoned for residential purposes. 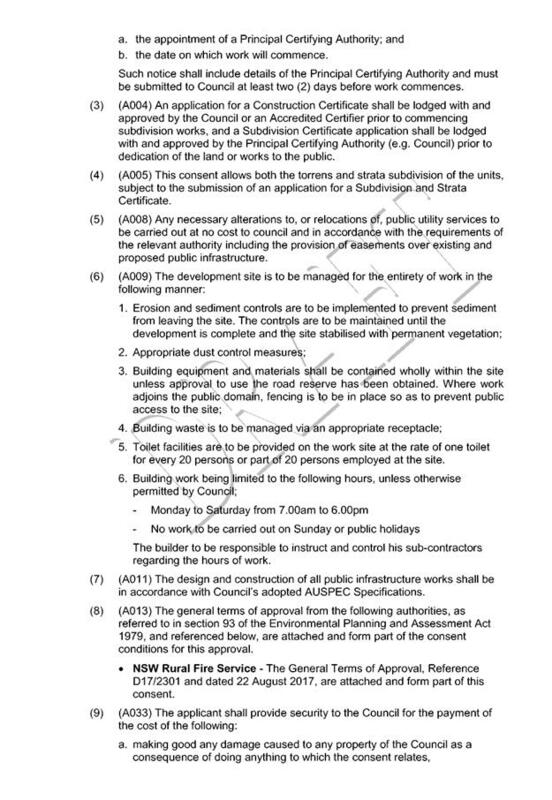 · Clause 4.3, the maximum overall height of the building above ground level (existing) is 9.35m which is unable to comply with the standard height limit of 8.5m applying to the site. · Clause 4.4, the floor space ratio of the proposal is 0.76:1.0 which complies with the maximum 1:1 floor space ratio applying to the site. · Clause 4.6 – The application seeks to vary the 8.5 metre height limit identified under Clause 4.3 of the LEP. - Having regard to the other dwellings in this locality, it is considered that the proposed building is compatible with the height, bulk and scale of the existing and likely future character of this locality. The sloping nature of the land results in dwellings with garages on the lower level, and two levels of living area above. This design is the same as proposed for the subject land. Thus, whilst the design has followed the slope of the land, a small area of the roof exceeds the 8.5m height. These roof areas provide sunlight into the internal areas of the dwelling, and minimize the need for windows on side boundaries which may adversely impact on privacy. 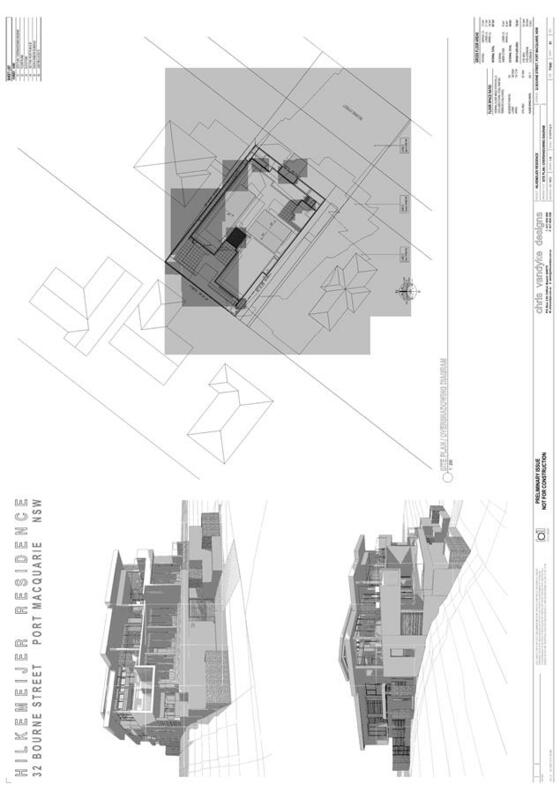 - The shadow diagrams also demonstrate that the proposed dwelling will not adversely impact on overshadowing, including the additional height. The shadows do not reach the property on the north eastern side, nor the dwelling to the rear of the subject land. The dwelling to the southwest has shadowing along the side of the land. The 9am shadow falls across the adjoining dwelling, and the 12 noon shadow is partially on the adjoining land, however by 3pm, there is no shadow on the adjoining property. The areas of the roof line which exceed the 8.5m height do not alter the shadowing on this adjoining property. - It should also be noted that the area of the roof which is greater than 8.5m above the existing ground level is towards the front of the subject land. This minimizes the likelihood that these parts of the roof line will impact on the view lines of the dwelling behind (fronting Anderson Street). - Compliance with the development standard is unnecessary as the areas of the roof which vary the height standard do not impact on overshadowing, view lines, or perceptions of building bulk and scale. - The primary bulk of the building is contained within the 8.5m height limit. - The extent of the height is limited to only a maximum 0.85m or 10% above the 8.5m standard. The point of the roof eave as part of the front east elevation where the height increases to above 8.5m is where the existing ground level increases in steepness falling to the street. The eave does not also extend past the front balcony on the uppermost level. 7. For the above reasons, the objection is considered to be well founded and it is recommended that the minor variation be supported. 9. In accordance with the Department of Planning and Environment Circular PS 08-014, the proposal includes variations to the LEP which is not greater than 10% and therefore can be determined under delegated authority (Development Assessment Panel has delegations to determine). A noting report will be required to be made to an Ordinary meeting of the Elected Council to note the clause 4.6 variation should consent be granted. 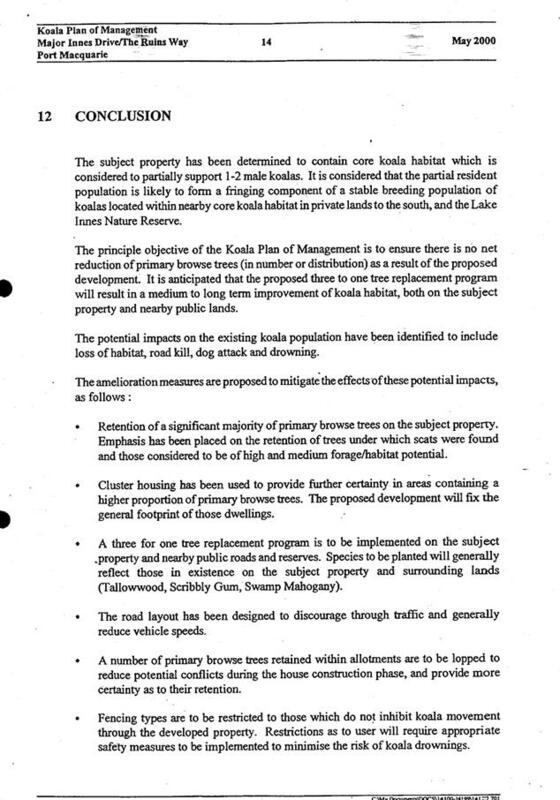 · Clause 5.9 – there are several listed trees which are greater than 3m in height and therefore require approval under Development Control Plan 2013 for removal. None of the trees are considered to be significant enough to warrant retaining from an ecological point of view. The proposal is not inconsistent with the requirements of the draft Coastal State Environmental Planning Policy. 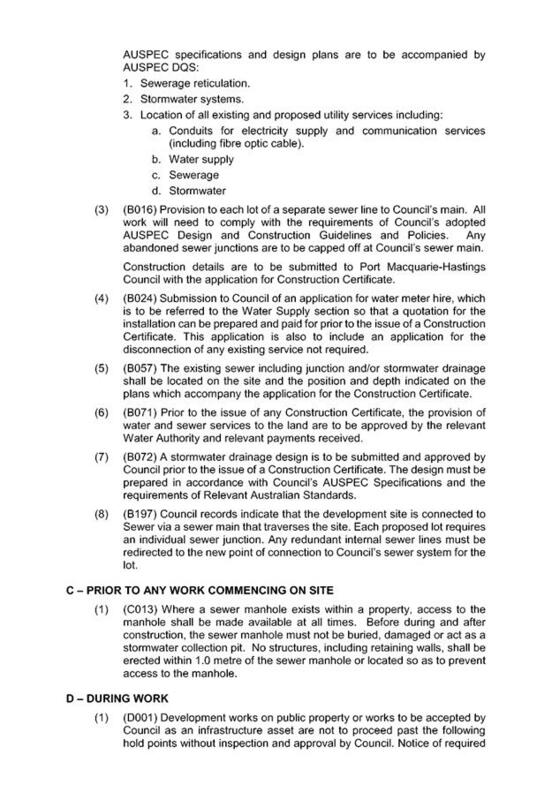 No water tank has been shown on the plans which is required under the BASIX certificate as submitted. A minimum 2000 litre water tank will need to be installed on-site. There is a section of the elevated swimming pool and upper first floor level balcony on the eastern-most corner of the building forward of the assumed 4.5m front building line setback. The balcony has a minimum 3.5m setback and the swimming pool has a minimum 3.0m front setback. The DCP does not define an articulation zone including a maximum percentage width however does specify particular building features permitted forward of the typical 4.5m front setback – see beside in left column. The block width is 18.3m and the floor area of the balcony forward of the primary 4.5m building line setback is 5.8m2 or 21% of the articulation zone. The proportional area width is less than the typical 25% permitted when making reference to the criteria in State Environmental Planning Policy (Exempt and Complying Development Codes) 2008. Note the variation for the section of the elevated swimming pool forward of the assumed 4.5m primary front setback within what could be an additional articulation zone would make the calculated area above 25% to an area of 40% of the proportional frontage. The terms and definitions on their own within the Codes SEPP which are referred to in the DCP do not strictly specify the maximum width permitted. On the lower middle level there is one structural wall in proximity to the master bedroom within articulation zone. The elevated swimming pool is considered to be required to be considered under the primary building line setback controls however it is noted that it is not forward of the typical 3m front setback for an articulation zone. The lower middle level has a minimum 4.5m front setback to the wall of the master bedroom. The upper floor level has a minimum 4.5m front setback to the main section of the outdoor living deck and 3m to the elevated swimming pool (which has had its setback modified from a zero front setback to a minimum 3m as currently proposed). With regards to the lower garage floor level the setbacks are addressed in the following garage development provisions. The entire lower garage floor level is considered to be a garage. The garage door is proposed to be setback 4.0m from the front boundary. The setback for this garage door has been increased from an original proposed setback of 1.5m. The remainder of the garage wall structures are partly 1m above existing ground level and not considered to be basement parking (ie would need to be less than 1m above ground entirely). This requires consideration under the recommended setback provisions. In this regard, the garage walls (not including retaining walls) have a minimum 1.5m front setback. Electric gates are proposed as part of the garage, recessed under the building, with a total width of 4m. The proportional width of garage gates is 23% of the building width. The driveway crossover width proposed is 3.5m and 19% of the proportional width of the site frontage. The middle lower level is proposed to have a minimum 3.8m setback to the rear wall of the laundry. The first floor level is proposed to have a minimum 3.48m rear setback to the wall of bedroom 5.
b) Council may consider varying rear setback requirements where it is demonstrated that the private open space could achieve better solar access between the building and the side setback. c) In that instance one side setback should be a minimum 4.0m in width (for an equivalent length of rear boundary, behind building line) and the rear setback may be reduced to 900mm. d) A detailed site analysis is to be provided indicating the impact of the design on adjoining dwellings and open space areas. South side = Zero setback to childrens bathroom and covered entry accessed off the adjoining public pathway. The remainder of the building has been setback 0.9m or greater along the southern boundary. South side = zero setback to elevated swimming pool and deck off living room. The proposal has demonstrated that no adverse overshadowing impacts can be identified to neighbouring properties relating to the side setbacks for the building components associated with the upper first floor level in particular. All building walls are set in and out as required. >35m2 min. private open space area including a useable 4x4m min. area which has 5% max. grade has been provided. No direct views between living areas of adjacent dwellings when within 9m radius of any part of window of adjacent dwelling and within 12m of private open space areas of adjacent dwellings. There is a privacy screen proposed along the majority of the north elevation of the upper first floor level. No additional privacy screens are recommended. 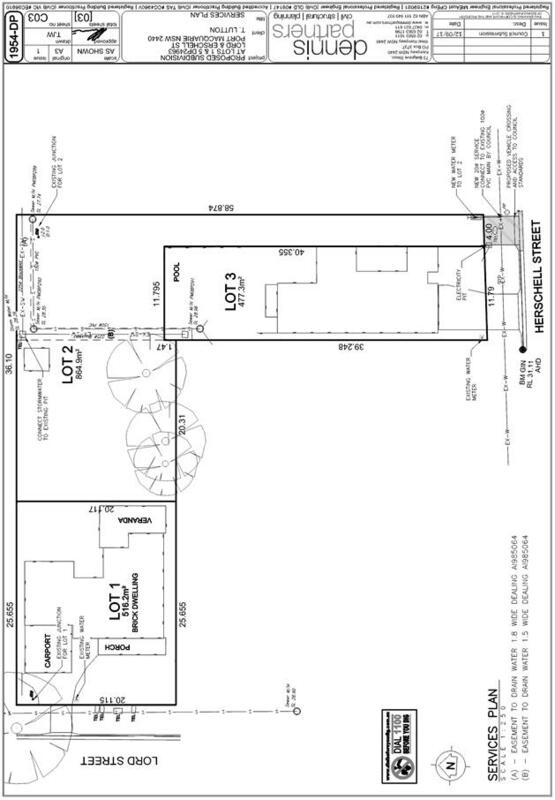 The finished surface floor level of the rear yard is proposed to be RL25.75m and the survey submitted shows varying existing ground levels up to a maximum RL 26.81m therefore the maximum height of the cut in the rear yard is approximately 1m. The front retaining walls in front of the garage walls are greater than 1m in height. No hollow bearing trees identified for removal. 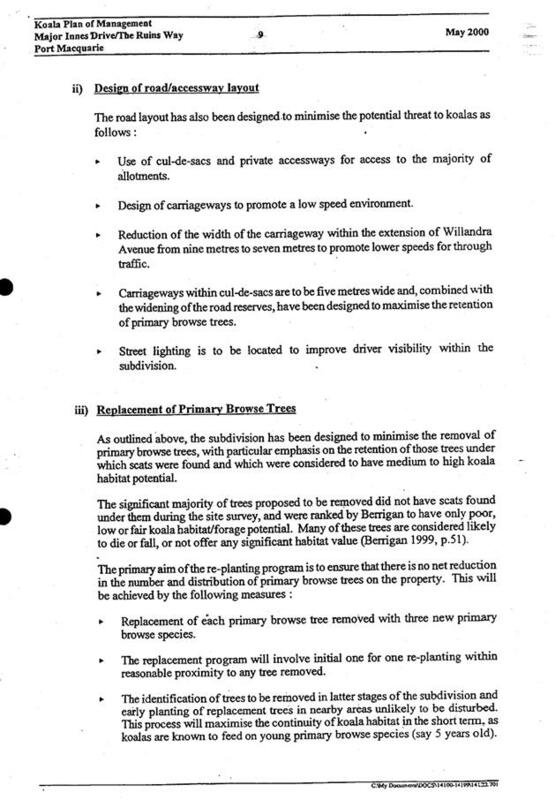 There are several listed trees which are greater than 3m in height and therefore require approval under Development Control Plan 2013 for removal. None of the trees are considered to be significant enough to warrant retaining from an ecological point of view. This site is not subject to any identifiable environmental constraints as listed. Single driveway crossing proposed with minimal width which will retain street parking. 4 off-street parking spaces accessed via an internal parking turntable. Single dwelling. Landscaping indicatively shown in the front setback area. Driveway grades are capable of meeting Council standard driveway crossover requirements and will be subject to further detailed review as part of a roads crossing permit required under Section 138 of the Roads Act prior to construction commencing. 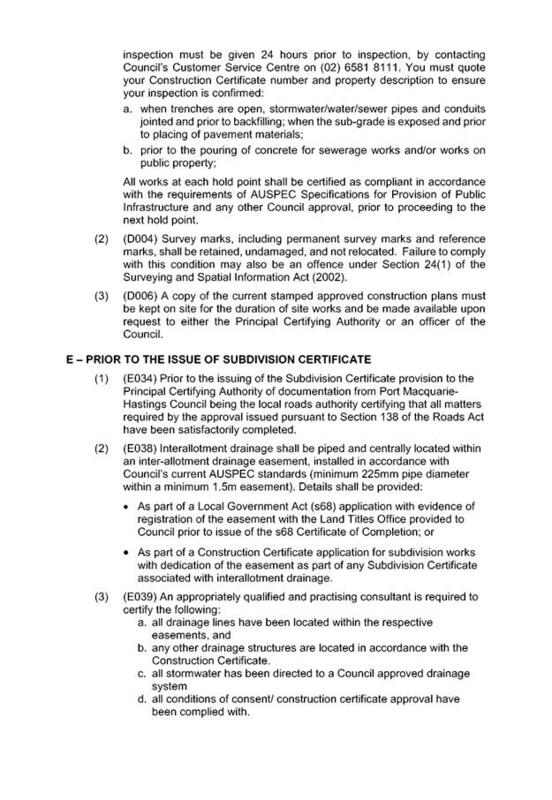 Single dwelling proposed and no issues identified with drainage associated with the short length of driveway accessing the garage can be assessed as part of the plumbing permit required to be obtained under Section 68 Local Government Act prior to construction commencing. No area provided. Cars could be washed on grassed nature strip. The proposal seeks to vary the Development Provision relating to the recommended primary front building line setback. The elevated swimming pool (as amended) is proposed to be constructed forward of the recommended 4.5m setback to a minimum setback of 3.0m. Front setbacks should support an attractive streetscape. · The swimming pool will be visible within streetscape as shown below with a similar setback to that permitted for balcony or other articulation zone structure with a minimum 3m setback. · The bottom of swimming pool level is positioned some 6m above street level and will not be imposing in the streetscape given its elevated height. The minor encroachment at pedestrian street level will be unlikely to be adverse. · The depth of the swimming pool is limited to 1.5m and the front of the swimming pool is proposed to be a glassed structure reducing the impact of the structure in streetscape. 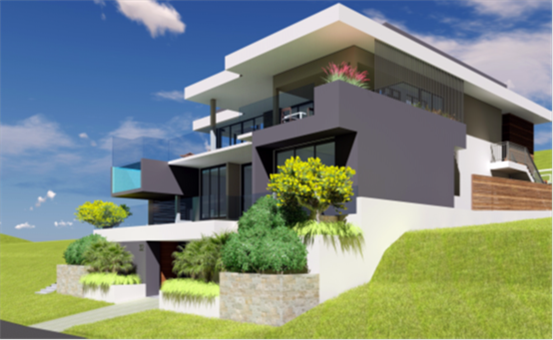 · A balcony could alternatively be proposed to a minimum 3m setback off the front boundary with a solid balustrade and be considered as an articulation zone. It should be noted that there is no technical definition restriction width to the articulation zone area in the DCP however Council staff have typically used the standards of State Environmental Planning Policy (Exempt and Development Codes) 2008 as a guide. If the pool and the north-eastern balcony are added together they equate to an area of approximately 40% of the built area forward of the 4.5m assumed primary front building line. · The two building elements being the north-eastern deck section forward of the 4.5m assumed primary building line setback and the elevated swimming pool section forward of the same primary setback are significantly separated at each end of the building. Both of the building elements referred to are not entirely solid in nature with glazing proposed in part. · The middle floor level has a compliant primary front setback with the 4.5m recommended development provision. · The central built balcony component of the dwelling is compliant at 4.5m. 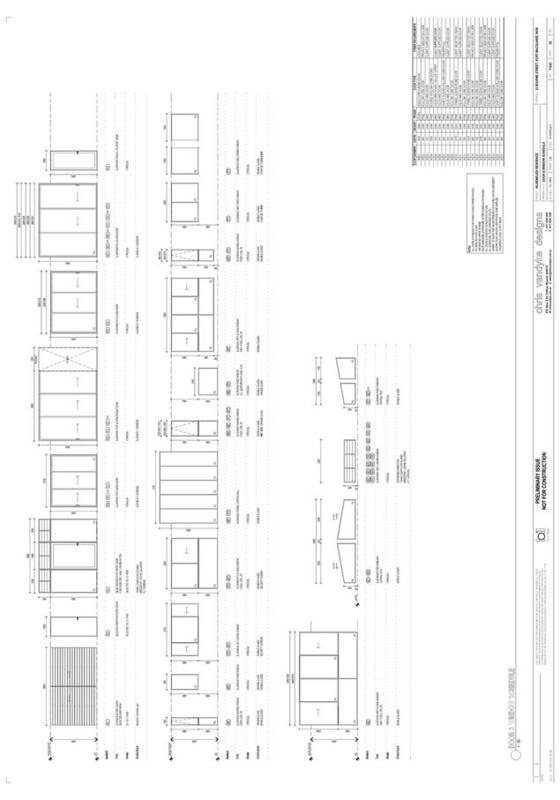 · The middle lower level has its central building wall components set back further than the minimum 4.5m front setback. The building level immediately under the swimming pool is setback greater than 4.5m. · The swimming pool has had its front setback increased significantly from the original proposed zero front setback to 3m. The changes made to the proposal during the assessment of the application have made significantly reduced the potential impact on the streetscape. · There are no identifiable adverse view sharing impacts in the locality associated with the swimming pool being 1.5m forward of the 4.5m recommended setback. The proposal seeks to vary the Development Provision relating to the recommended front setback to the garage. The garage door is proposed to be setback 4.0m from the front boundary which is within the minimum recommended 5.5m setback. The setback for this garage door has been increased from an original proposed setback of 1.5m. The remainder of the garage wall structures are partly above 1m above existing ground level with a minimum 1.5m front setback. To minimise the impact of garages and driveways on the streetscape, on street parking and amenity. To minimise the visual dominance of garages in the streetscape. · The garage gates are set in under the lawn terrace area above as part of the lower level middle level of the building. · The site slopes upwards from Bourne Street in a steep manner for the first eastern half of the site. · The garage parking area is set low into the site with the western end of the dwelling effectively under existing ground level. · The garage has 4 parking spaces therefore reducing the potential for impact on-street parking even without providing for the recommended 5.5m setback. · The site currently has no formalised off-street parking for the existing dwelling. · Landscaped stepped planter beds are proposed in front of the garage wall structures. · The driveway width is limited in width to 4m out of the 18.3m width frontage. · The garage gates are limited in width to 4m and significantly less than the maximum 50% building proportional width permitted. The proposal seeks to vary the Development Provision relating to recommended side setbacks. On the garage floor level the side setback is a minimum 0.69m on the northern side and zero setback on the south side adjoining the public pathway. On the lower middle level the side setback is a zero setback to children’s bathroom and covered entry accessed off the adjoining public pathway. On the upper first floor level the side setback is a zero setback to elevated swimming pool and deck off living room. · With regard to the garage setback on the northern side the majority of the garage is below existing ground level as the garage extends further into the site and the 0.21 encroachment into the recommended 0.9m setback will be unlikely to result in adverse amenity impacts to the northern neighbour. 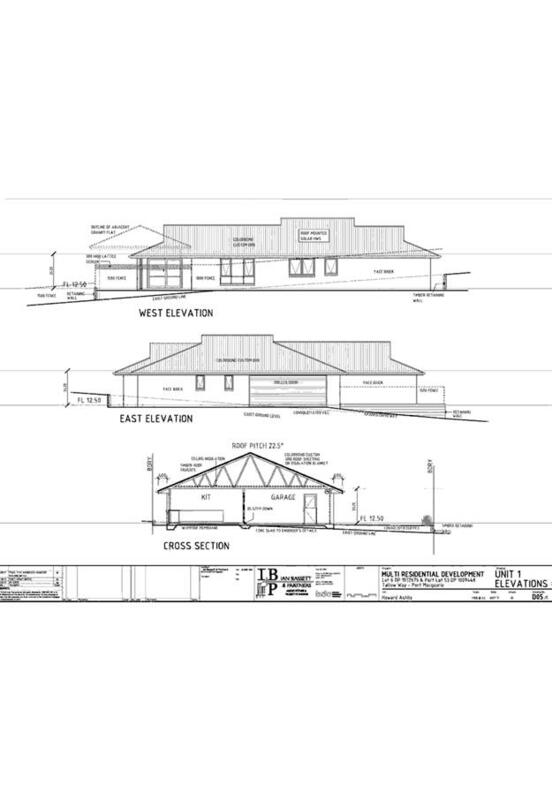 · With regard to the garage setback and other sections of the building on the middle and upper levels having a zero side setback this is considered acceptable given the adjoining public pathway which provides amenity separation to the southern adjacent neighbouring property. The pathway corridor is approximately 3.4m wide. There are no identifiable adverse impacts to neighbouring properties. The proposal seeks to vary the Development Provision relating to the recommended minimum rear setback development provisions with a minimum 3.48m setback. · To allow adequate natural light and ventilation between dwellings/buildings and to private open space areas. · No adverse overshadowing or privacy impacts can be identified. · The rear yard space and private open space areas for the development are well in excess of the minimum standards. The proposal seeks to vary the Development Provision relating to the recommended maximum retaining wall height development provisions to between 1m to 2m in height along the street frontage of the development. · Minimise the extent of site disturbance caused by excessive cut and fill to the site. · Ensure there is no damage or instability to adjoining properties caused by excavation or filling. · Ensure that there is no adverse alteration to the drainage of adjoining properties. · Ensure the privacy of adjoining dwellings and private open space are protected. · Ensure that adequate stormwater drainage is provided around the perimeter of buildings and that overflow paths are provided. · The exceedance of height of retaining walls in front of the garage will not lead to excessive site disturbance given the existing levels across the front eastern section of the site. · There is no adverse impacts including privacy or overshadowing identified to the neighbouring properties with the height being above 1m. · There are no potential adverse drainage impacts identified with the proposal. A further approval will be required before construction commences for all plumbing and drainage and engineering certification of walls and building structures. · The height of the retaining walls will be beneficial to the streetscape appearance of the garage wall extending across the site frontage to soften its bulk and scale. · Substantial landscaping is proposed within the subject retained areas. · The lower retained areas will be finished to a high standard with feature stone cladding which will assist with reducing the perceived visual impact of the relatively hard line structures. Council may consider varying the development provisions where it can be adequately demonstrated that the objective to which the provision relates can be wholly achieved by reasonable or innovative solutions and the proposal is consistent with all relevant LEP aims and Zone Objectives. Based on the above assessment, the variations proposed to the provisions of the DCP are considered acceptable and the relevant performance based objectives have been satisfied. Cumulatively, the variations do not amount to an adverse impact or a significance that would justify refusal of the application. • The proposal is considered to be sufficiently consistent with other residential development in the locality and adequately addresses planning controls for the area including justifiable variations to the Building Height and other Development Provisions under Development Control Plan 2013. • It is noted that on the western side of the Bourne Street along the length of the street that there are many dwellings with a more generous front setback under previous historical planning controls. In this situation it is considered that the current Development Control Plan 2013 envisages a change of character, in which case compatibility with the future character is more appropriate than with the existing. There is no notable architectural style (roof form, fenestration and materials used) or established landscaping (including large canopy trees) within Bourne Street to have specific regard to. It is considered that the variation to the front setback with regard to the elevated swimming pool in particular and also in combination with the north-eastern deck will not result in an adverse streetscape unity desired by the DCP given its unique design attributes. • There are no identifiable adverse privacy impacts having regard to recommended development provisions of Development Control Plan 2013, the design of the new building’s primarily living areas and the privacy screening proposed. • There no adverse identifiable overshadowing impacts. The proposal does not prevent adjoining properties from receiving 3 hours of sunlight to private open space and primary living areas on 21 June. During the neighbour notification period concerns surrounding view loss were raised by the adjoining north-eastern neighbour at No.30 Bourne Street. Using the planning principles of NSW Land and Environment Court in Tenacity Consulting v Warringah 2004 NSW LEC 140, the following comments are provided in regard to the view impacts using the 4 step process to establish whether the view sharing is acceptable. No. 30 Bourne Street enjoys views to the south-west of North Brother Mountain. This view is considered iconic in the local context. The significance of this view is considered to be high. 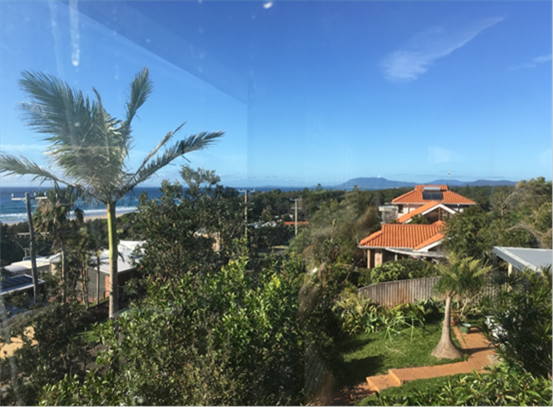 Several properties to the west including No.32 Anderson Street (which was inspected during the assessment of the application and no submission received) enjoy views across the site of the Pacific Ocean including breaking waves and some interface between the land and water. The significance of this view is considered to be high. The southern neighbour No. 34 Bourne Street was not inspected during the assessment of the application however is noted to be single storey and may enjoy some views to the east/north-east of the Pacific Ocean and Tacking Point Lighthouse in the distance. No submission was received from this neighbour. Comments: Affected views from No. 30 Bourne Street are obtained from two habitable levels of the neighbouring dwelling. The primary living areas are on the lower level and bedroom areas on the upper level. A photo of the view from a bedroom on the upper level south-eastern corner of the No.30 Bourne Street dwelling looking across the development site towards North Brother Mountain in the distance is shown below. The views are obtained from both the sitting and standing position. Views from the lower level main living area are obscured by existing vegetation. Affected views from No.32 Anderson Street are primarily obtained from a first floor living area at the rear of that dwelling. The views of the Pacific Ocean are obtained from both the sitting and standing position on a deck and main living space. The affected views from No. 30 Bourne Street are obtained across a side property boundary and it is considered unrealistic that these views could be retained having regard to the planning controls for the area including acknowledgement that building elements can be proposed to a minimum 3m setback as part of an articulation zone notwithstanding that the north-eastern upper floor deck is where the deck extends out in part forward of the assumed 4.5m primary building line. Comments: The extent of the impact upon the views enjoyed from No.30 Bourne Street would vary between the two levels and location in which a person was standing/sitting. The proposed development will significantly obscure views to the North Brother Mountain from this location and additionally obscure part of the ocean view. From No. 32 Anderson Street, the broad ocean view will impacted when viewed from the upper level deck and internal living space. - The affected view is across a side property boundary and cannot realistically be expected to be retained having regard to the planning controls for the area. - Partial views to the ocean and Tacking Point Lighthouse would be retained from various locations at No. 30 Bourne Street. - The height of the building is compliant at the rear with regards to No.32 Anderson Street and would be unreasonable to prevent the expectation for such building height to be taken away. - Views retained to the ocean and Tacking Point Lighthouse from the upper level deck. - The primary significant views at No.30 Bourne Street are enjoyed from mostly the upper level bedroom areas. Comments: The majority of the proposal complies with the maximum building height of 8.5m set for the area. There are non-compliances with the provisions of DCP 2013 and in part the LEP building height, however none of these matters would have any impact on view sharing as they relate to driveway width, cut/fill and retaining walls. It would be possible for an alternative design to reduce the extent of view loss however it is considered unreasonable to refuse the application on such grounds. Overall, the proposal is considered to achieve a satisfactory view sharing outcome having regard to the above principles and is a reasonable response to the site conditions. The proposed development will be unlikely to create any concealment/entrapment areas or crime spots that would result in any identifiable loss of safety or reduction of security in the immediate area. The primary access to the dwelling is available from both the garage floor level and the adjoining public pathway. A condition is recommended to restrict no construction vehicles to be permitted to access the site from Anderson Street. 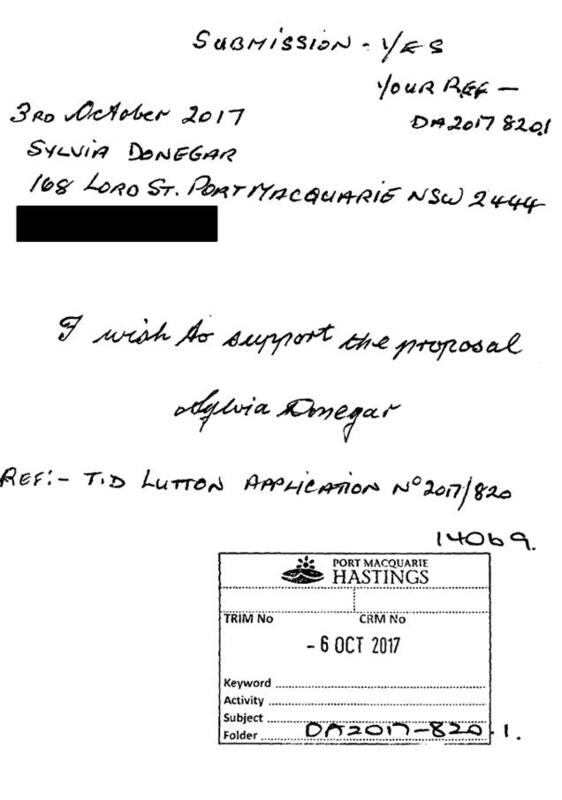 The proposal has been neighbour notified on two occasions primarily due the amended plans being submitted during the assessment of the DA. One(1) written submissions have been received following public exhibition of the application. The neighbour to the north at No.30 Bourne Street has raised issues of concern which are required to be responded to. Setback of upper level deck from the front boundary is inadequate and contravenes development standards. The deck on its own is permitted as part of an articulation zone forward of the 4.5m primary building line. 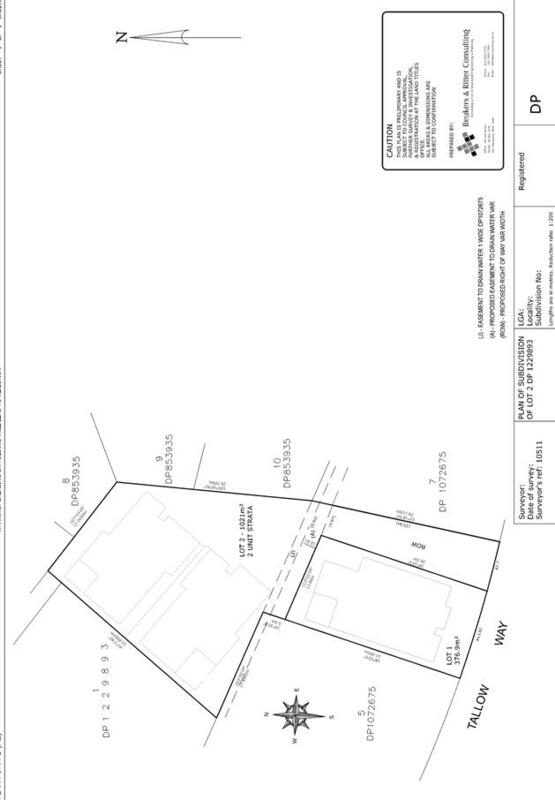 This section of deck referred to is in the eastern corner of the building and is proposed to be setback a minimum 3.5m which is 0.5m greater than the recommended development provision. 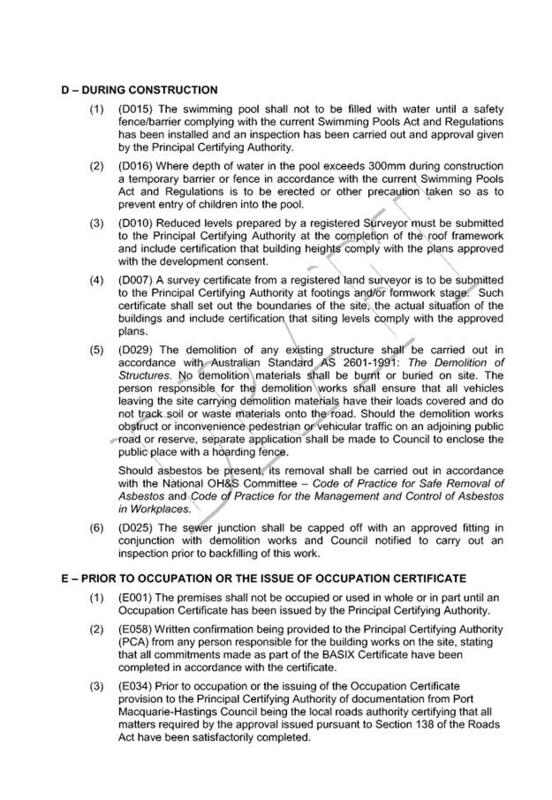 The elevated swimming pool is addressed on its own as a variation to front setback Development Provision contained in Development Control Plan 2013. The northern section of deck has extended out a further 1.5m compared to the original plans. This will impede views from the neighbouring north-east property thereby reducing the property value. It is correct and noted that the amended plans have reduced the setback of the deck referred to. These amended plans have been neighbour notified in accordance with Council Policy. As stated above the deck on its own is permitted as part of an articulation zone forward of the 4.5m primary building line. With regard to impact on views it is considered that whilst there will be a significant impact on views to the south for the neighbouring north-eastern property, views across side boundaries are difficult to retain. The views down the coast south towards North Brother mountain could be considered as ‘iconic’. The proposal is generally compliant and it is noted from a site inspection, the neighbour enjoys broad views of the Pacific Ocean. The neighbouring subject house has a generous setback from the front boundary for its main living space (lower levels) and upper bedroom floor space. It would be difficult to retain the views referred to even in the proposal had a 4.5m front setback for the upper level deck. It is also noted that the upper floor deck of the proposal has a privacy screen set back from the front of the deck which may allow some views through this space from the upper floor bedrooms of the neighbour’s residence in particular. Using the Planning Principles formed by the NSW Land and Environment Court and widely accepted for addressing such situations it would be difficult to warrant recommending refusal to the application or being reasonable to condition the deck to increase its set back. Refer to additional comment earlier in this report. Impacts on property values are unable to be considered as part of assessment of Development Applications. Only the merit impacts and compliance with statutory planning requirements including the Local Environmental Plan 2011 require consideration under the Environmental Planning and Assessment Act 1979. With regard to the amended plans, new calculations have shown that the articulation zone (deck with pool on it, plus the extended North-East deck) is approximately 42%, and not within the recommended 25%. Recent surveyor results showed that due to the floor levels, the neighbour’s main living area will be looking directly out to the extended North-East deck. This further supports the request that the set-back of the upper North-East deck be brought back to 4.5m. As stated above, the subject section of the north-eastern upper first floor deck on its own is permitted as part of an articulation zone forward of the 4.5m primary building line. 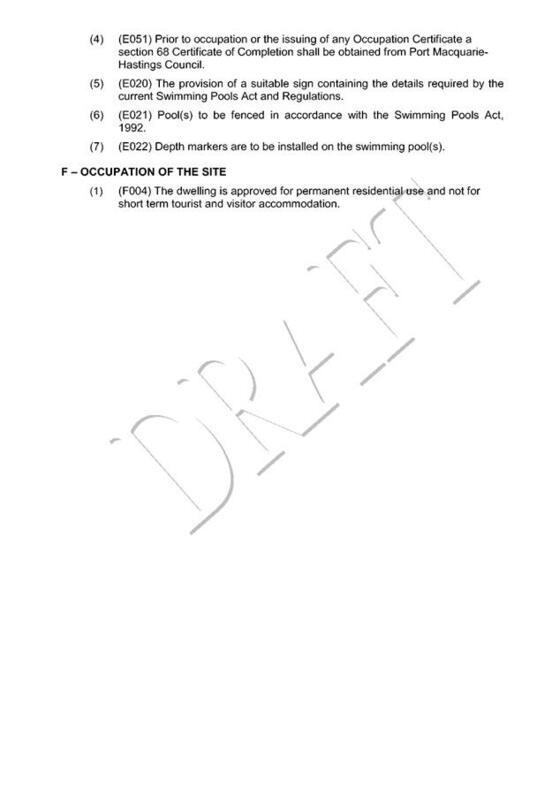 It is matter of interpretation on whether it could be argued that the swimming pool could be considered as an articulation zone and restricted to a 25% proportional area forward of the assumed 4.5m primary front setback line. Refer to comments earlier in this report addressing the front setback requirements. The height and location of the pool to the street will negatively impact on the streetscape and street appeal. The original setback of the swimming pool at a zero setback has been increased to 3.0m. The proposal (as amended) will need to comply with the Swimming Pools Act including likely requirements for a non-climbable barrier such as glass balustrade as indicatively shown on the plans. The substantial increase in floor space and scale of the building will extend close to the neighbour’s boundary. This will reduce the natural airflow and limit light. 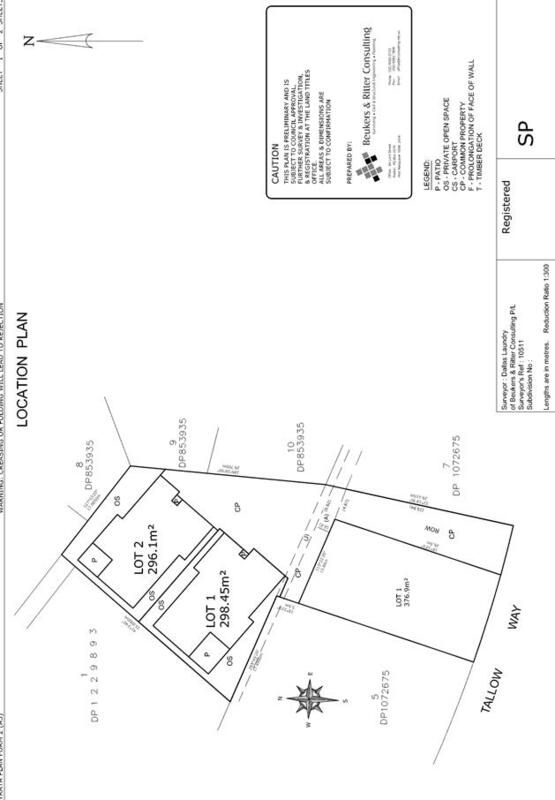 The proposal is compliant with the recommended Development Provisions under Development Control Plan 2013 with regard to side setbacks on the northern side with the exception of the lower ground garage floor level which has a 0.69m setback for part of the boundary which is also adjoining the neighbour’s garage. The proposal will not result in any identifiable adverse overshadowing impacts to the neighbour particularly in mid–winter. The impact of the scale and minimal side setback on the northern side of the site will have an adverse effect on the northern neighbour after 3pm daily. The proposed development satisfies relevant planning controls, including variations as justified, and is unlikely to impact on the wider public interest. No development contributions are applicable as the site is an existing Council approved residential lot.